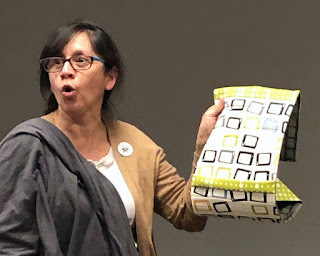 Daniela Syed, Vice President, led the meeting. 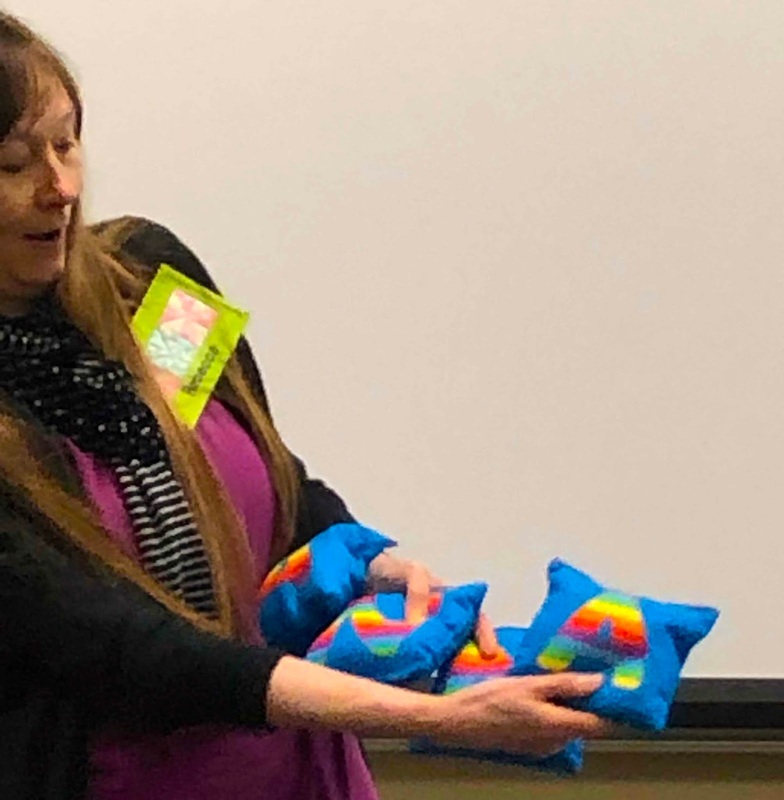 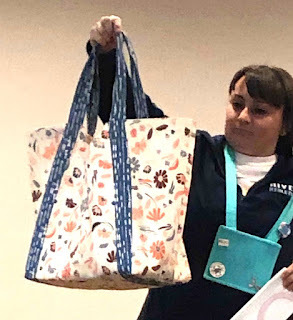 She welcomed two new members, passed out April birthday fat quarters, and drew door prizes for all attendees. 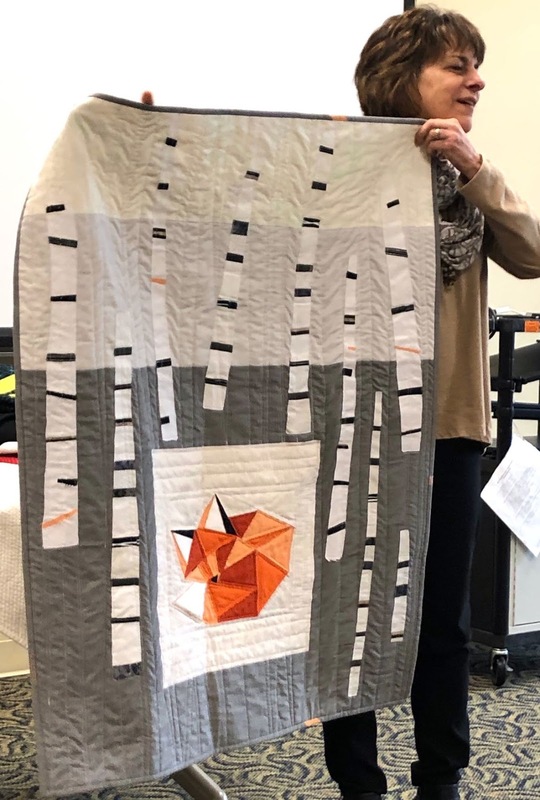 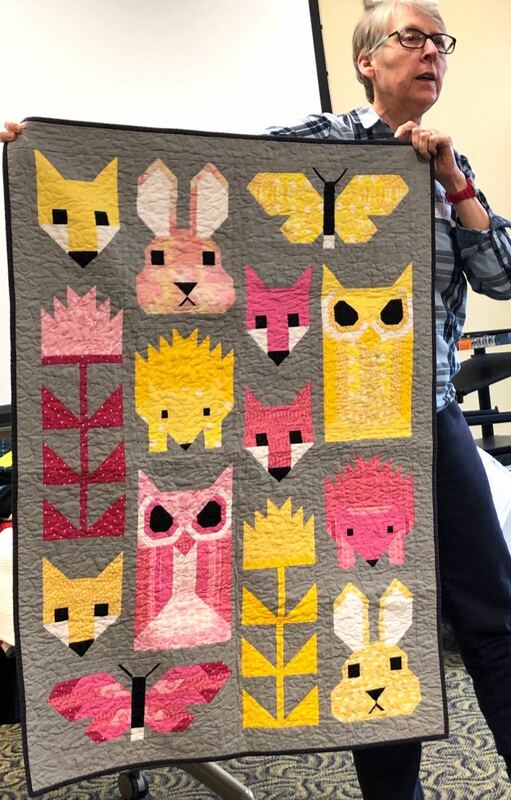 The charity quilt committee announced a theme of ANIMALS for this year's donation quilts - this could be animal fabrics, pieced or appliqued or quilted animals shapes. 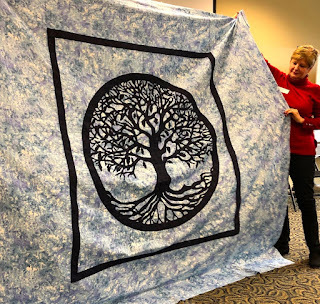 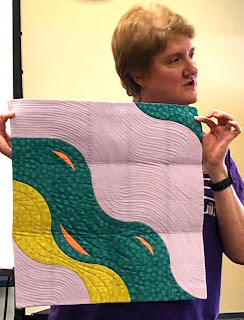 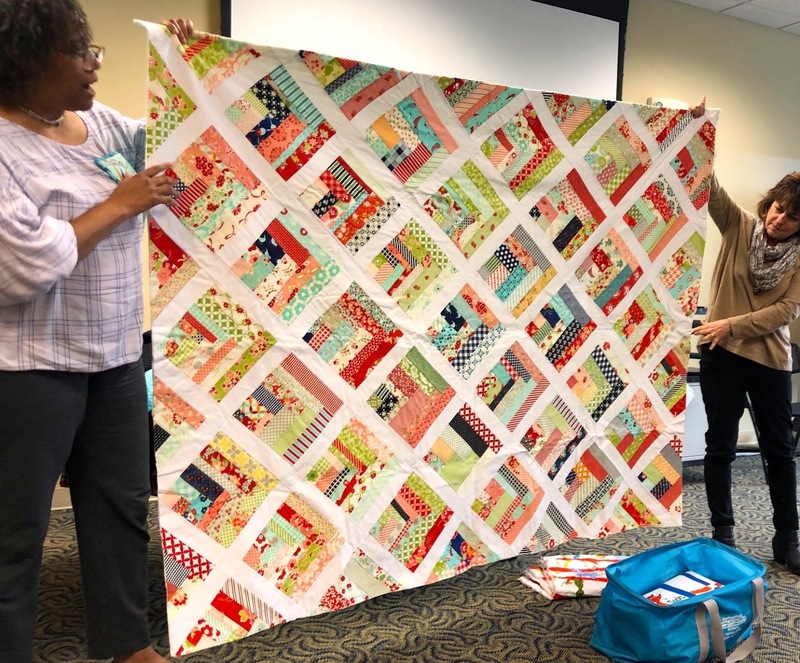 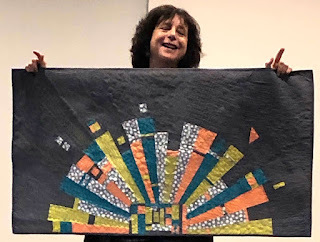 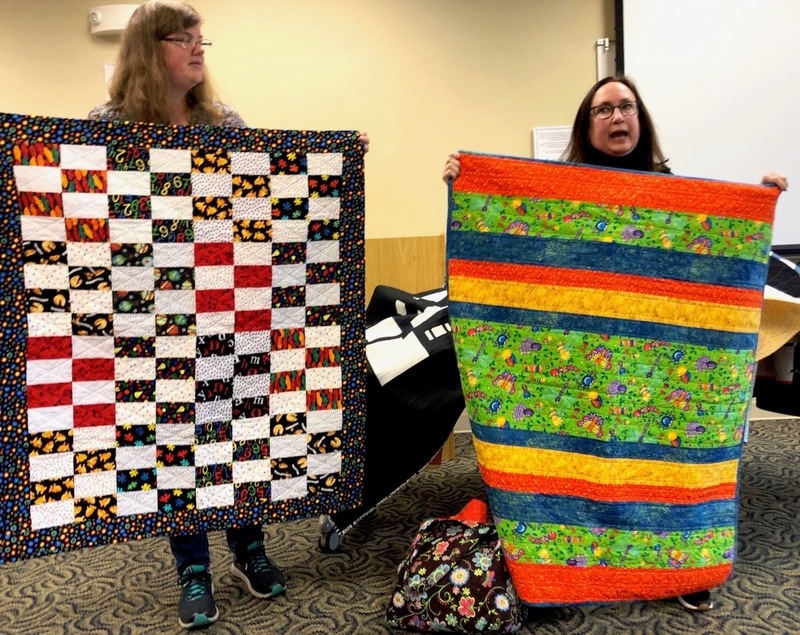 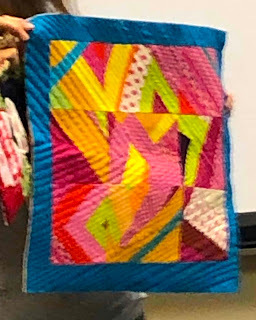 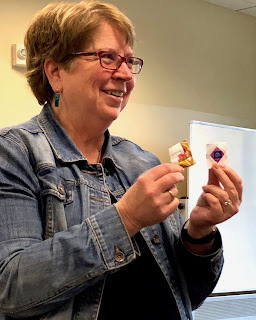 The program chairs lead a lively discussion about QuiltCon and members' experiences with getting there, staying there, and participating in the show. Daniela discussed current pricing ideas for our fall retreat and passed a list around to ask members what their intentions for attending might be (4 days stay, 3 days stay, day only and which days, etc.). 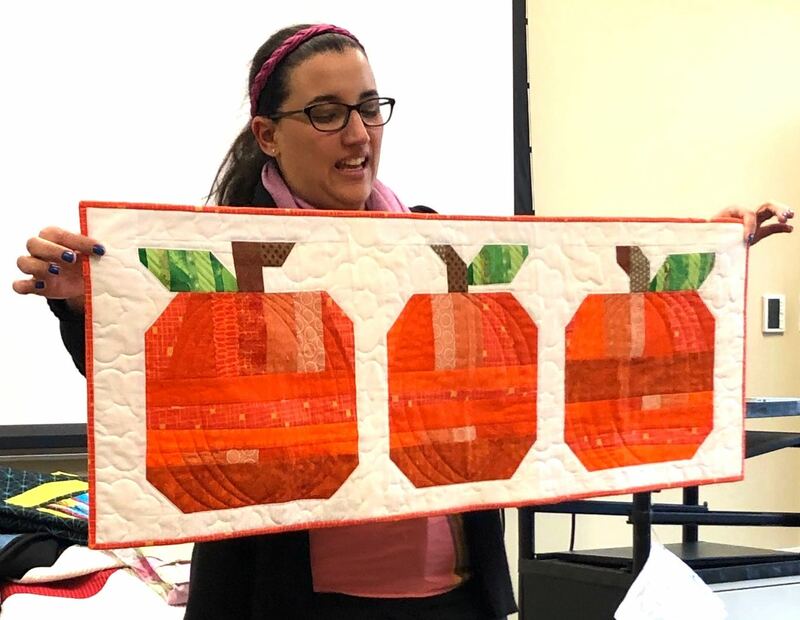 Daniela suggested that members start now to make prize items for next year's Quilt Bingo effort. 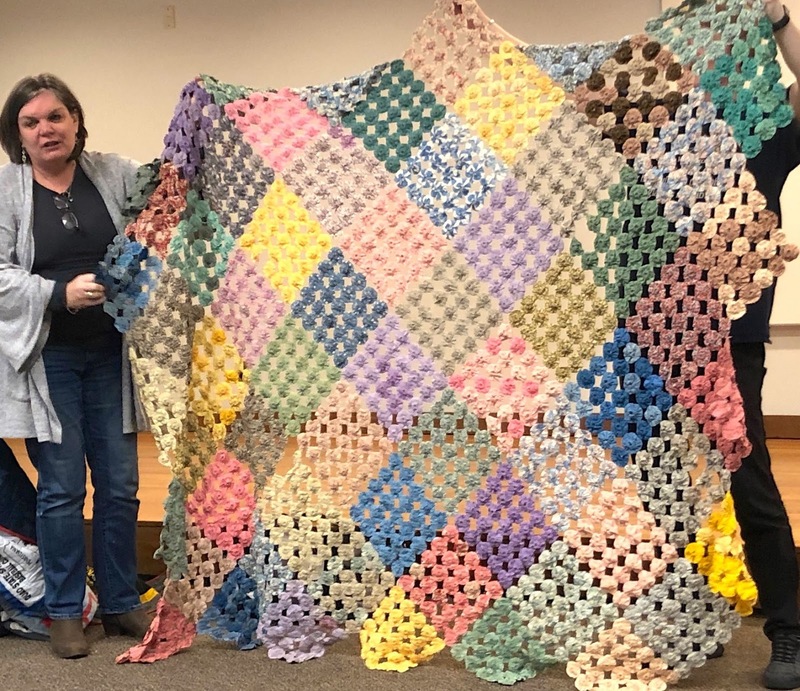 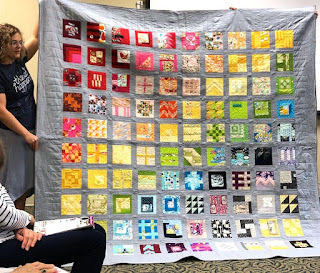 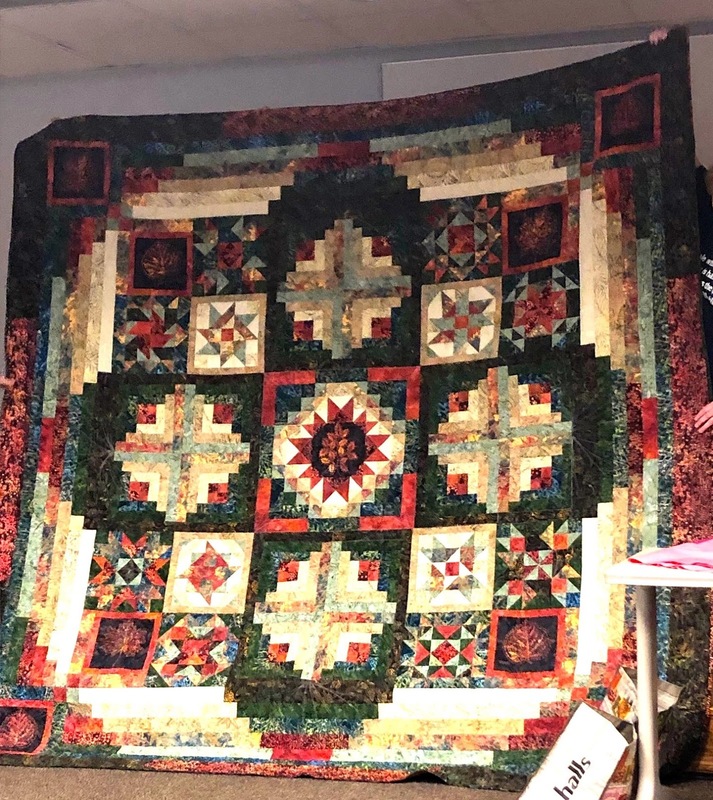 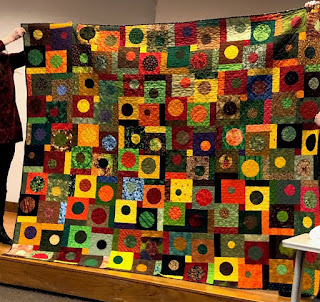 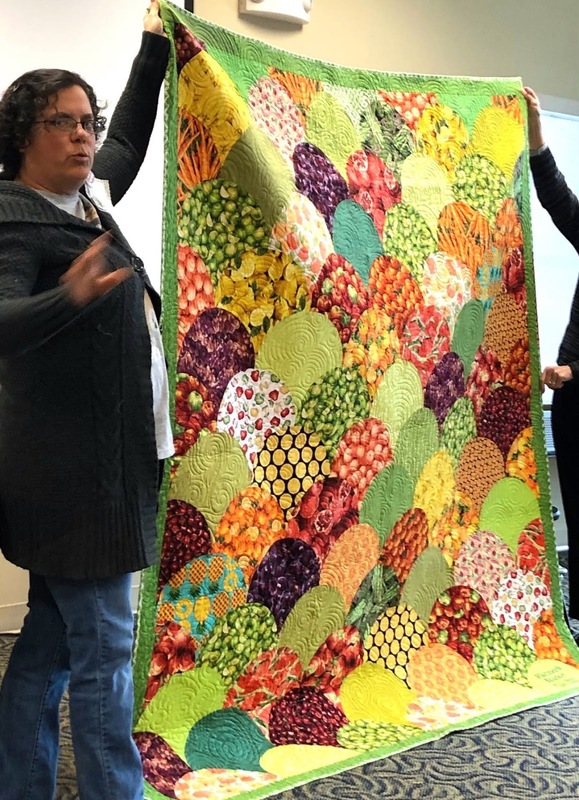 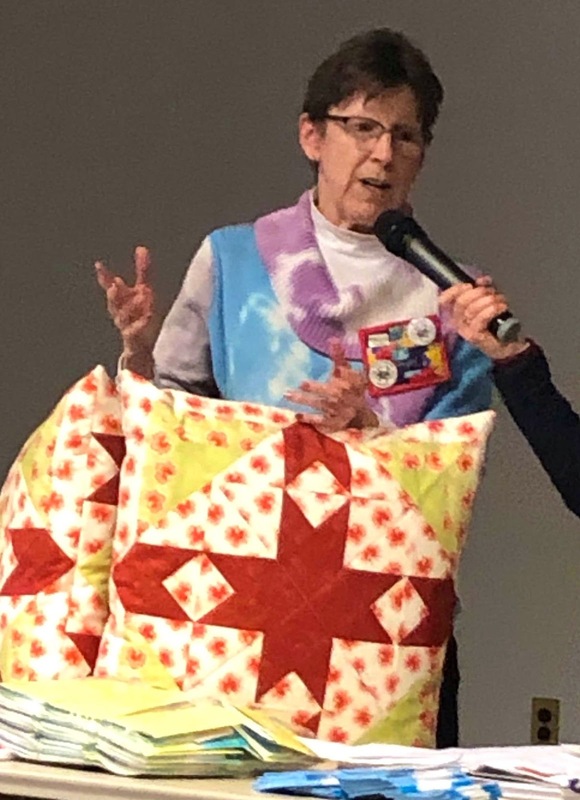 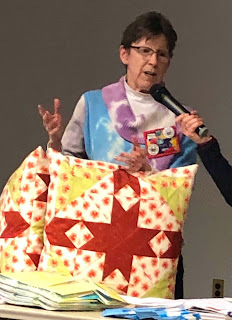 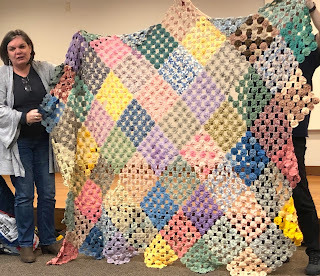 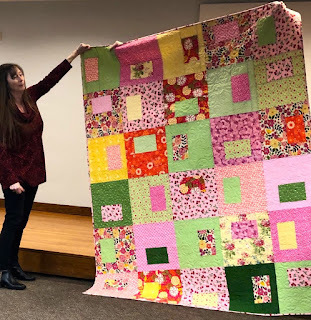 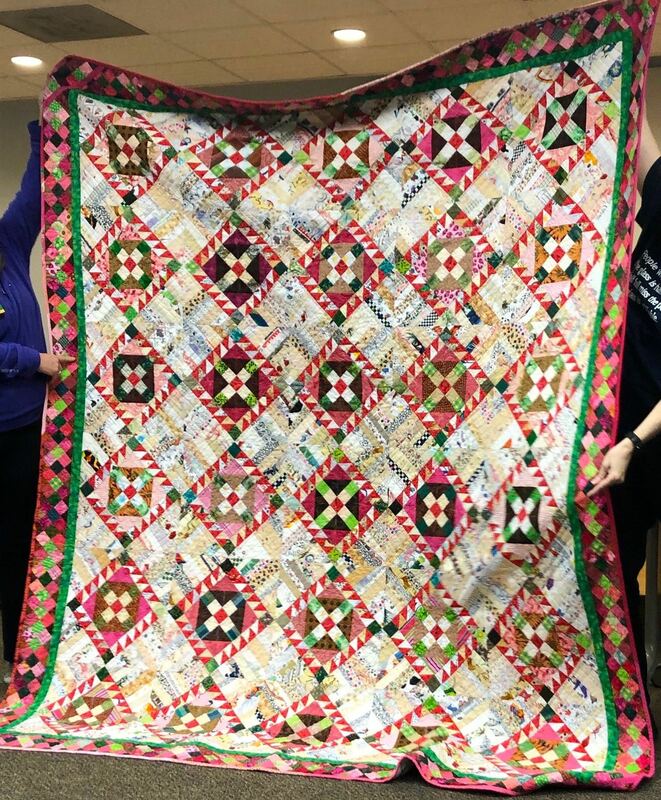 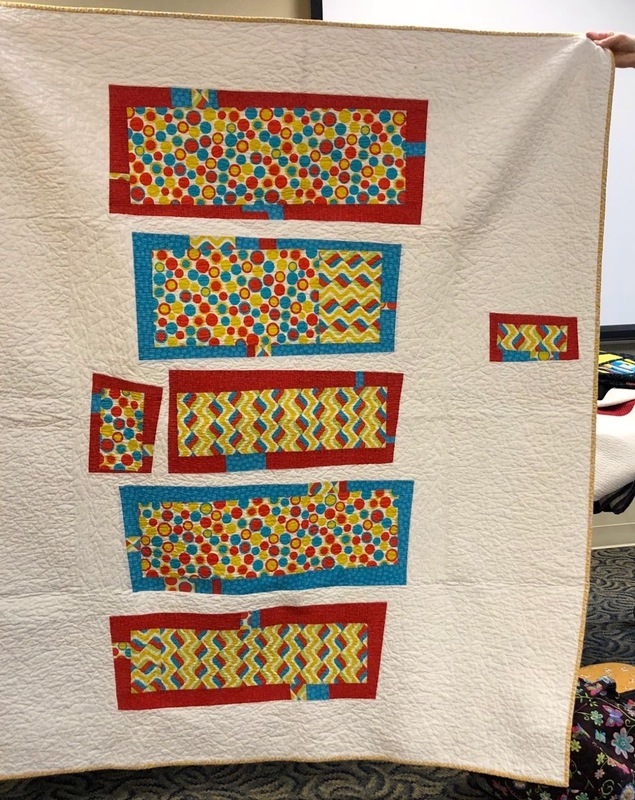 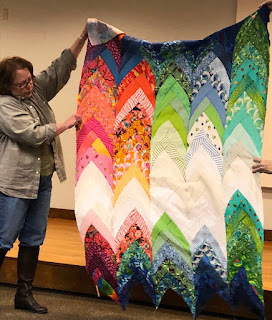 She also asked for members to volunteer to organize and coordinate the creation of major prize quilts (bed sized) - if we begin now, there will be less last-minute stress next year to get them finished. 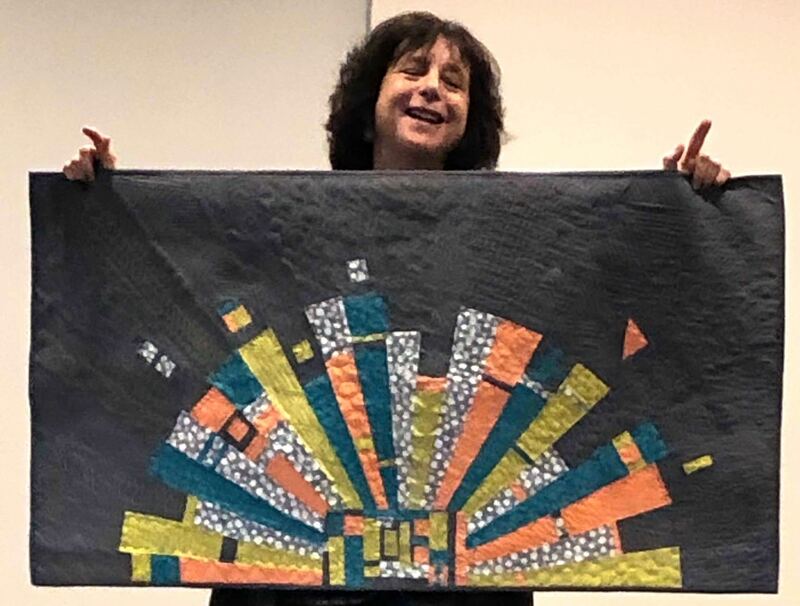 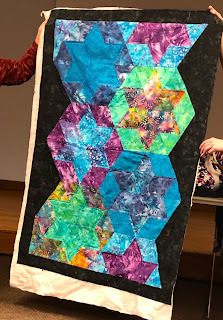 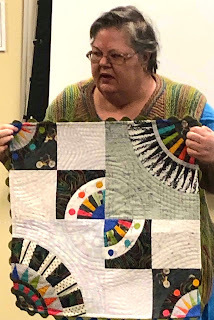 Sarah Lefebvre shared her wonky HST piece, "Functional Art"
And a completed UFO from a Jane Clark class. 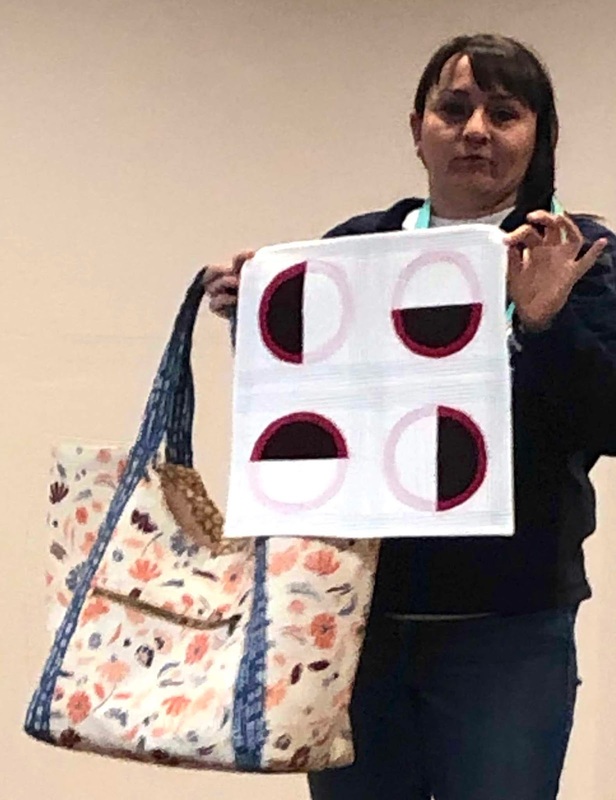 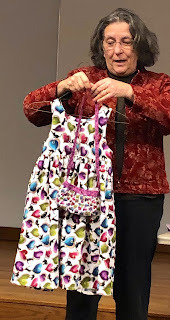 She also shared her 15 minutes of Play product and her flip-and-sew construction method for making a backing. 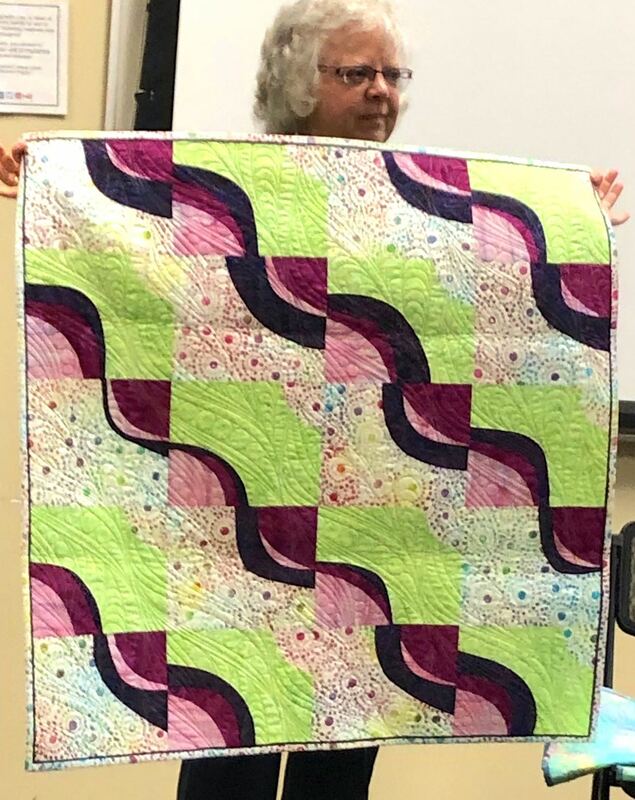 Mary Sloat showed her finished top from the curves class. 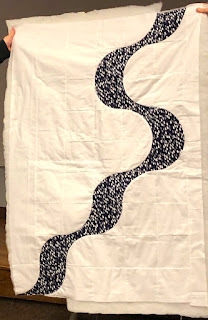 domestic machine and did some ruler quilting on borders. 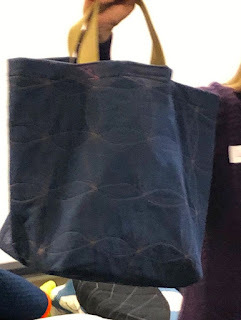 and a canvas tote bag incorporating her husband's old jeans. 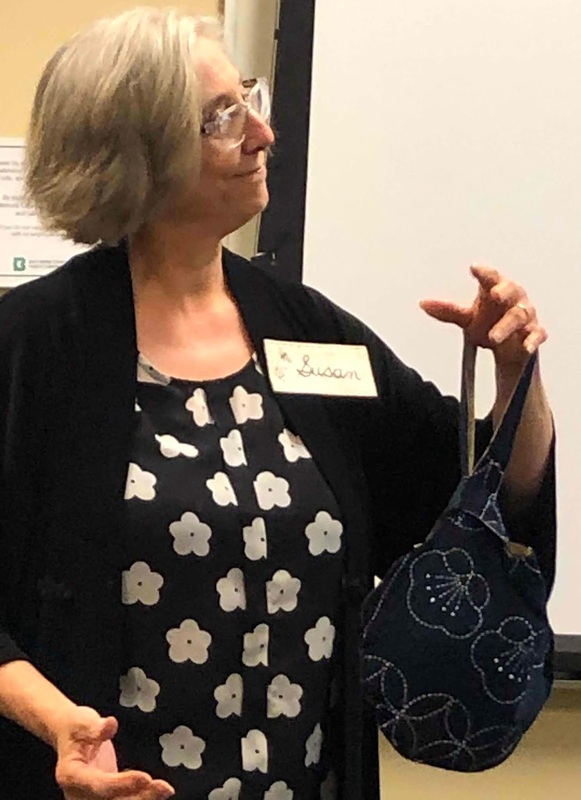 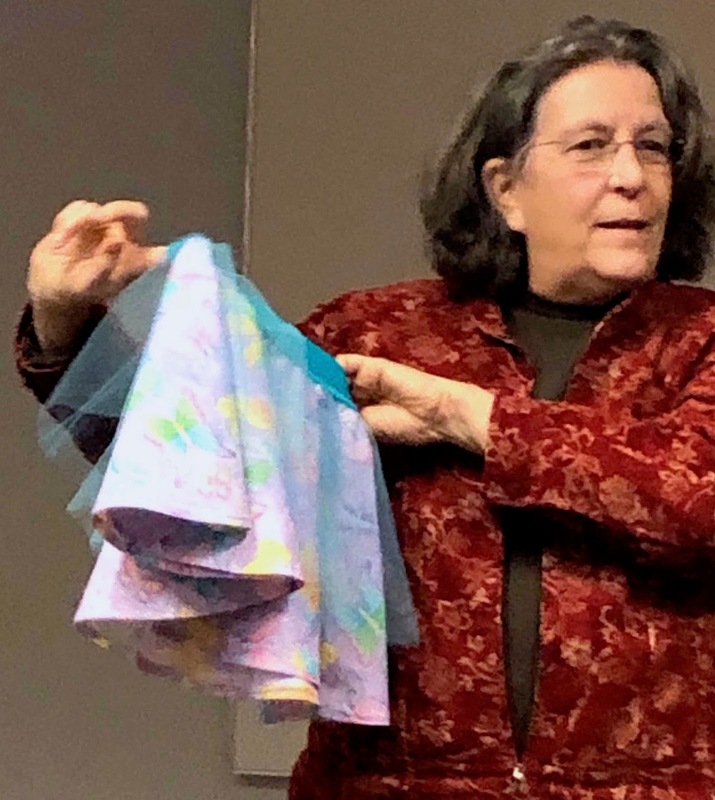 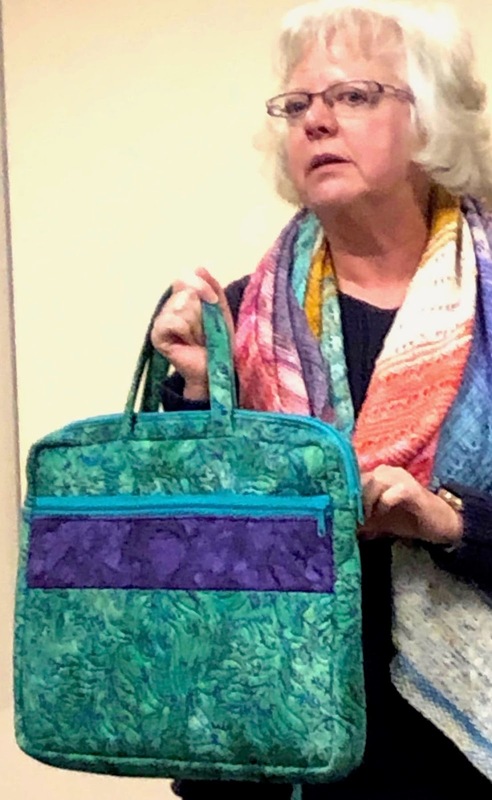 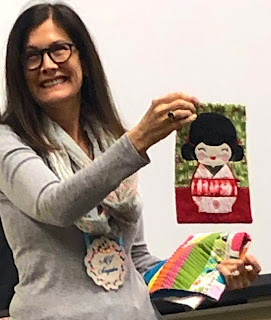 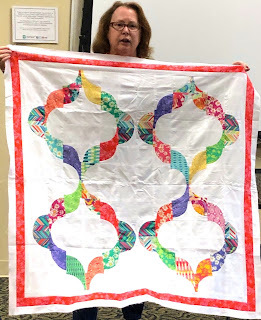 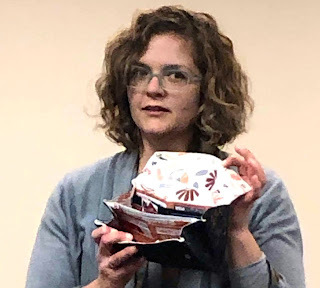 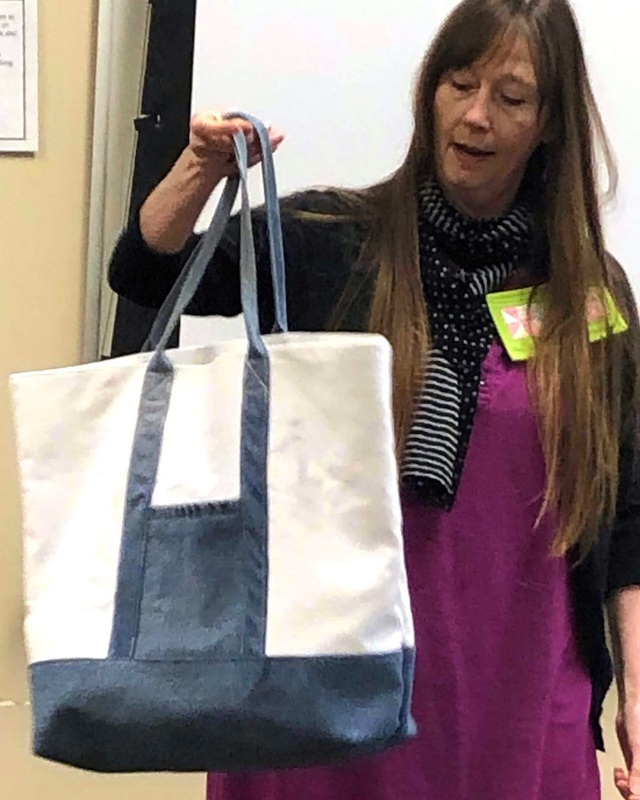 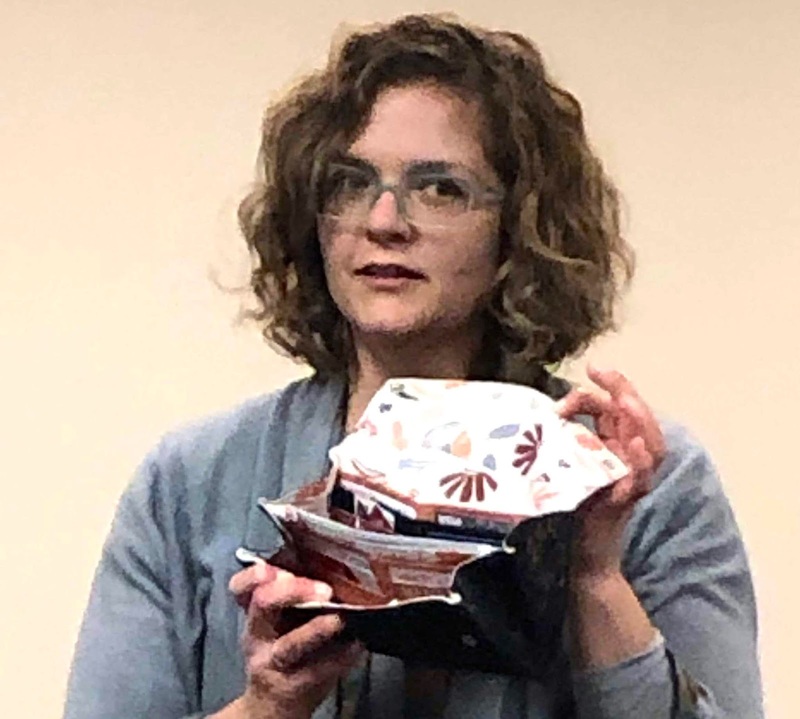 Susan Brightman finished an MAQ class project with sashiko stitching to make a Japanese knot bag that she uses for her hand sewing and associated notions. She got the pattern from pinterest and enlarged it by 200%. 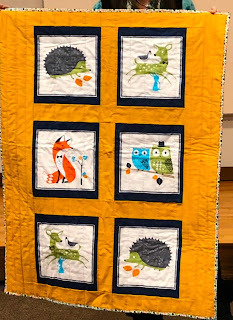 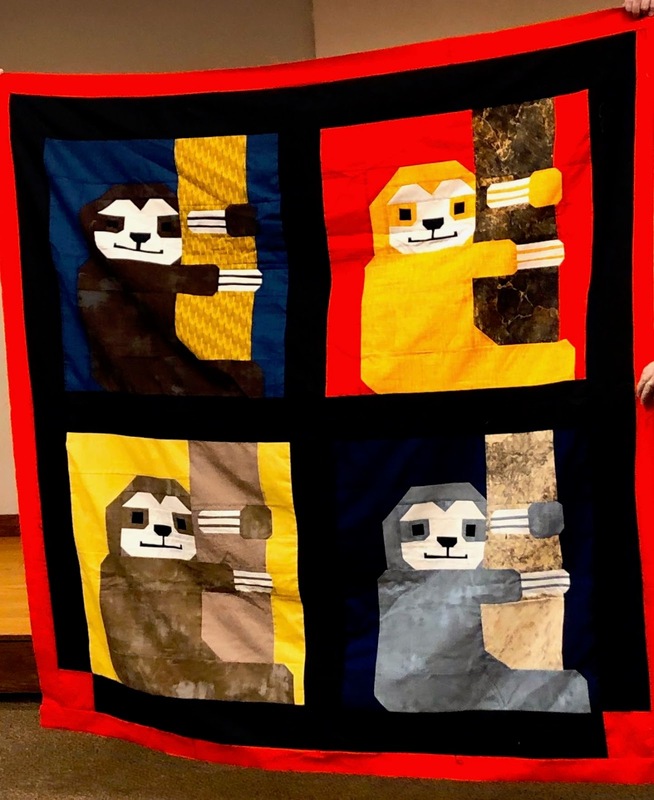 Sue Till made an animal-themed quilt for a charity donation. 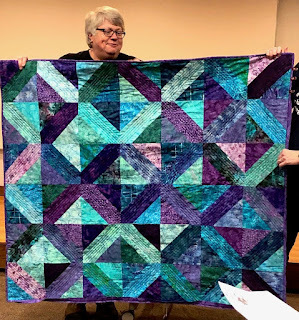 Annual membership guild dues are to be paid on/before Feb 28th. 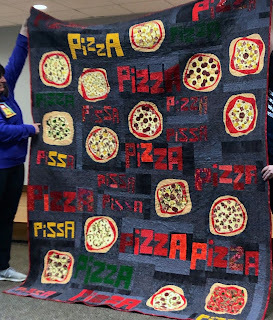 Our membership in the national guild must be updated in early March. You must pay on time to be included in the emailings for meeting information and workshop registration. 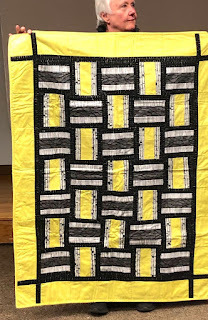 You can pay by check made out to Baltimore Modern Quilt Guild and handed or mailed to Jane Schiemer (treasurer) ... or by PayPal to Baltimore Modern Quilt Guild. As voted on last winter, annual dues are now $50 (of which $35 goes to national). 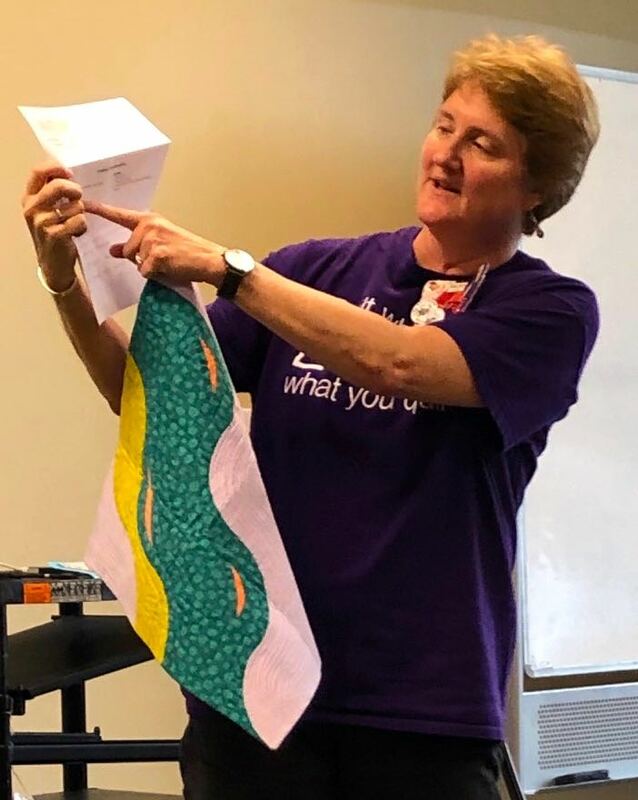 Our chapter's retreat is set up with a date (October 3 - 6, 2019) and place (Pearlstone Retreat Center, Reisterstown, MD). 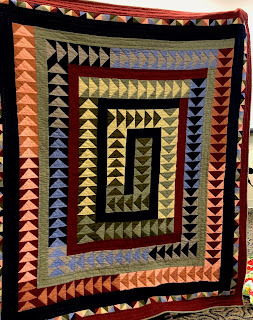 We have arranged a time spread of Thursday afternoon after 4 p.m. through Sunday afternoon at 5 p.m. 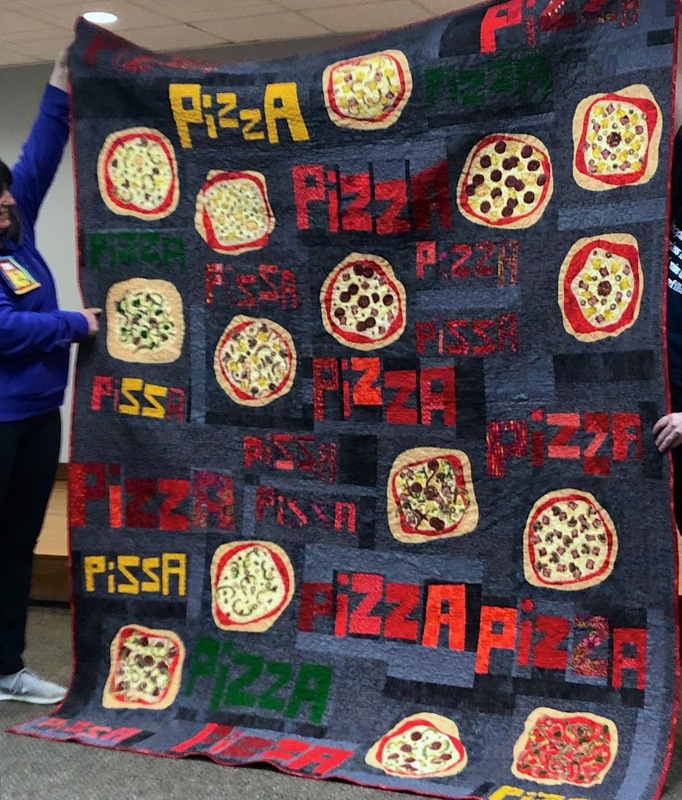 This will allow for more day pass attendees on the weekend. 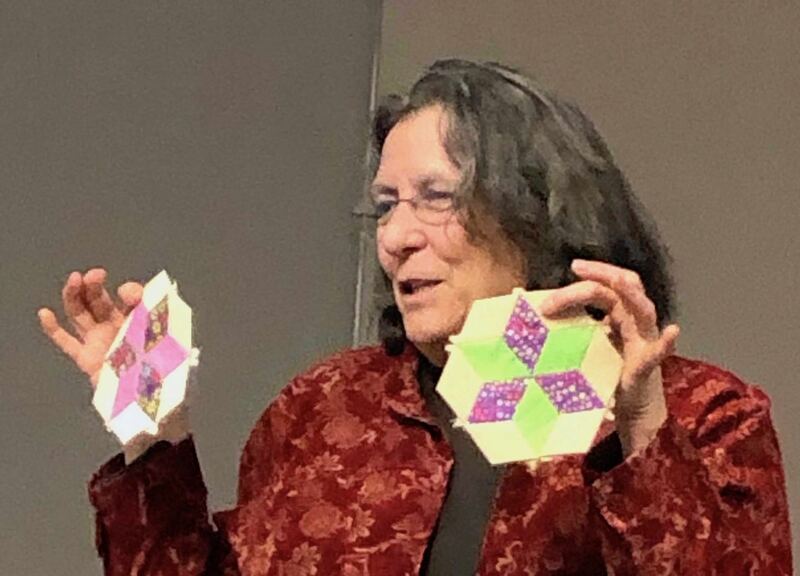 The March meeting will include a lecture by Jackie Gehring; workshop with her is planned for the Saturday before the meeting. 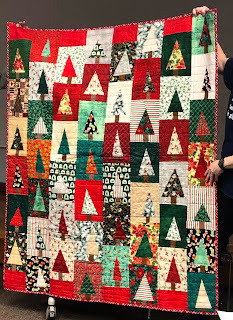 Registration will open later this week. 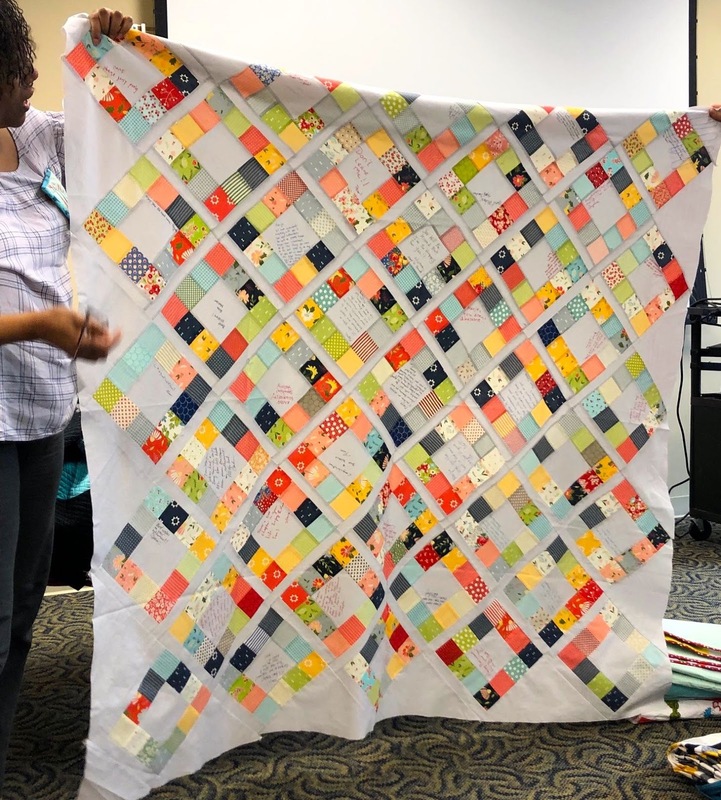 The May meeting is the designated time for the Members Only workshop. 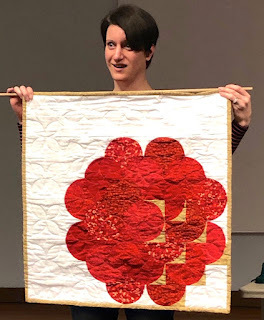 This year it will be a sewing day for paper piecing the guild’s crab logo. 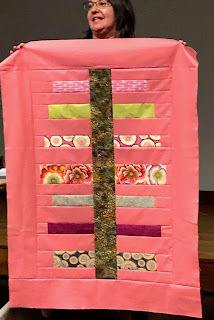 In May our meeting date is traditionally the third Sunday (Mothers Day is the second Sunday). 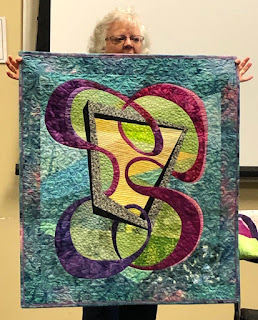 This year’s members only workshop should be held on Saturday, May 18th. 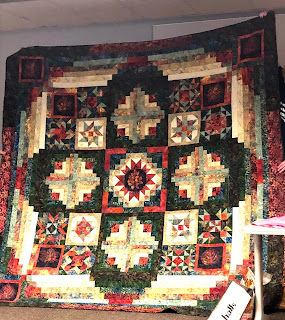 Watch for more details. In June we have Chawne Kimber teaching. 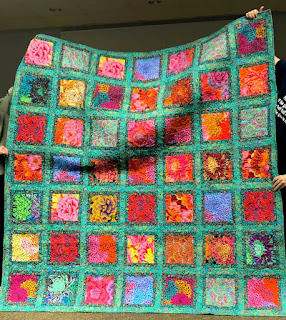 We are thinking of holding this in conjunction with a local art college of some kind as Chawne is a recognized artist. This will require advertising, etc. 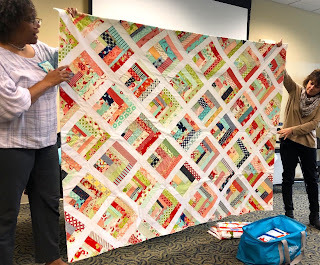 The program committee is working on details. 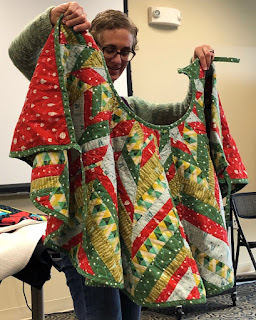 Since we had no meeting in January, there was extensive Show and Tell today. 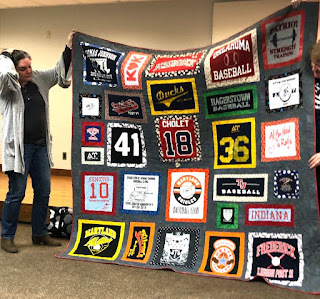 Also, the members present sorted out by membership number. If you choose to participate in the Name Tag Swap, longer term members will be swapping with newer members. 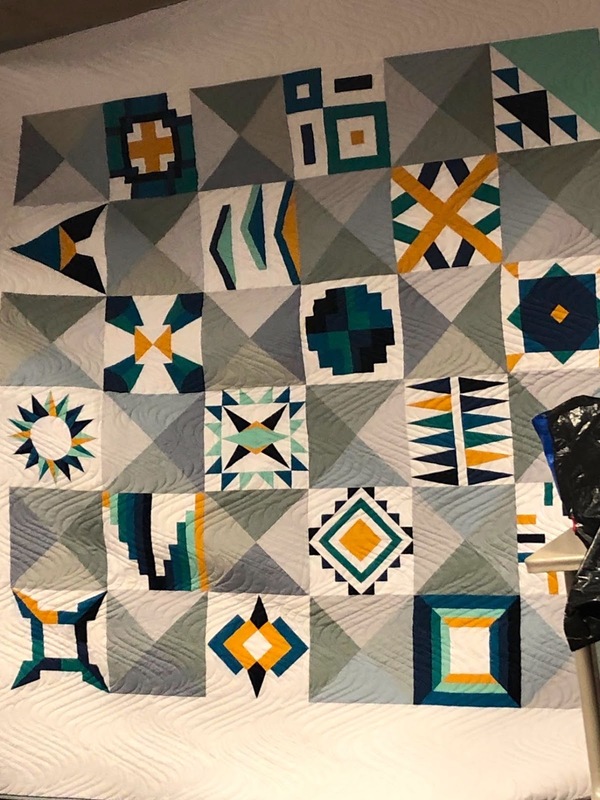 Watch for details. 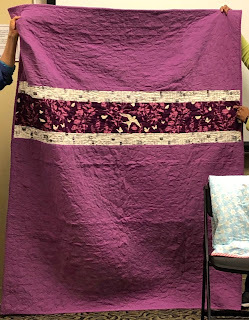 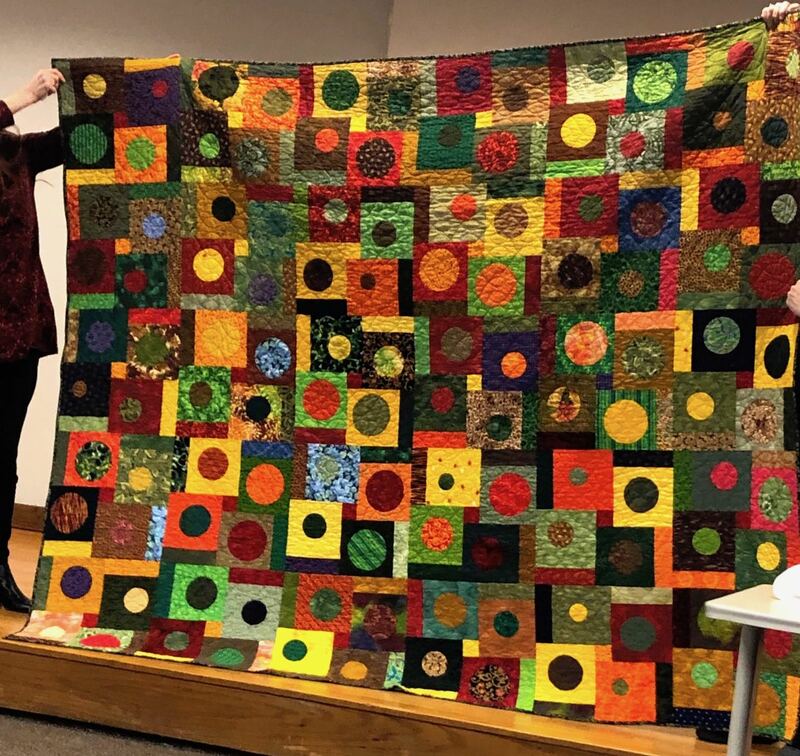 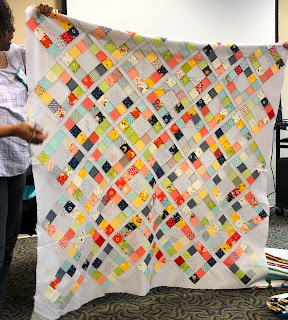 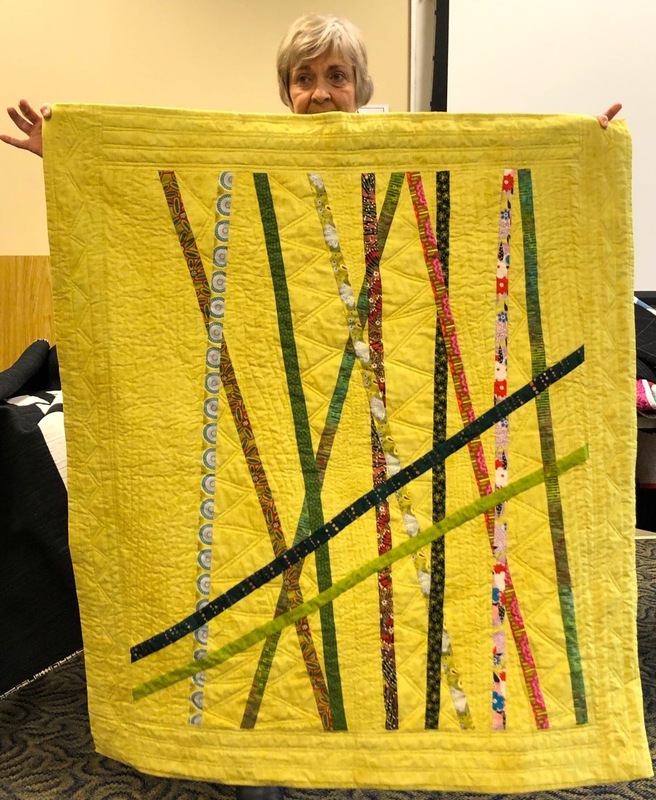 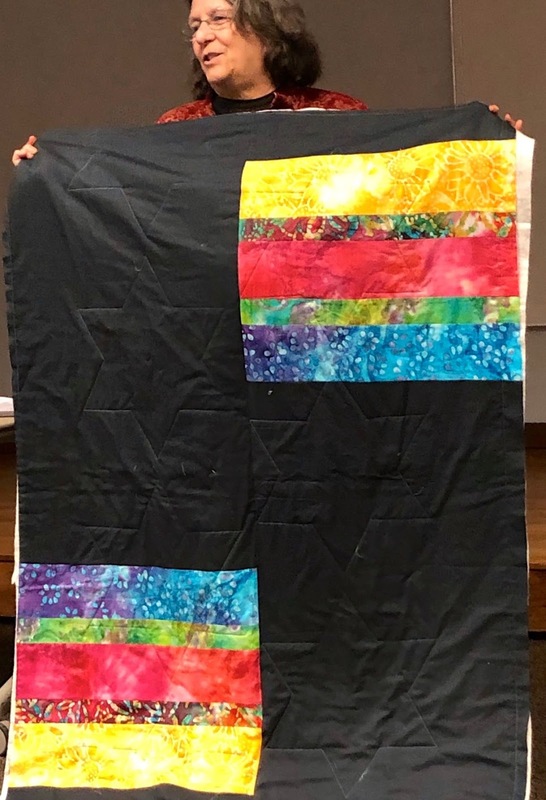 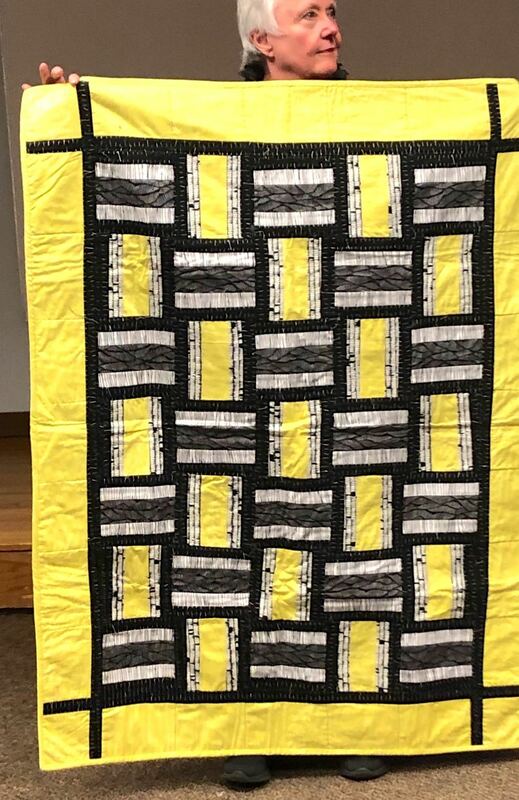 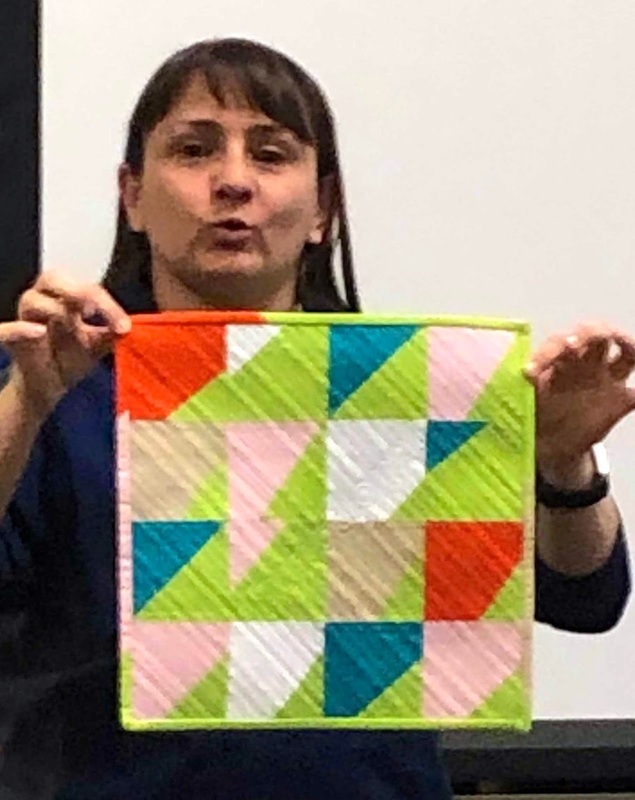 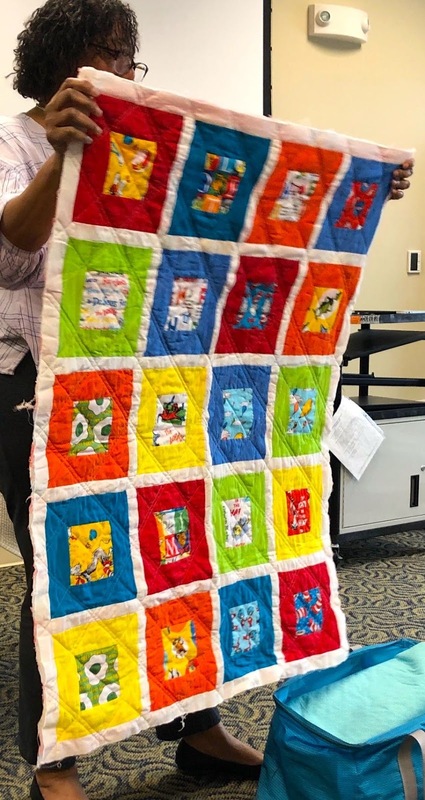 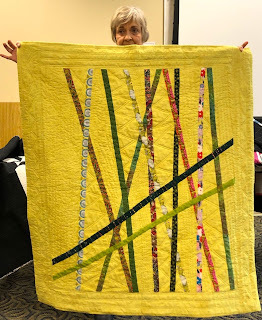 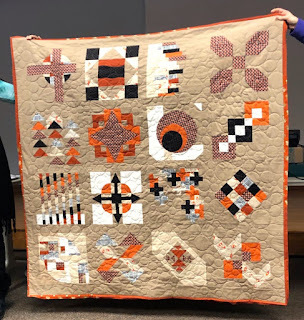 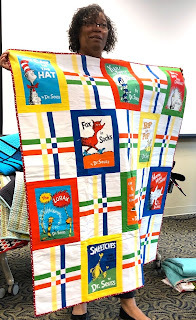 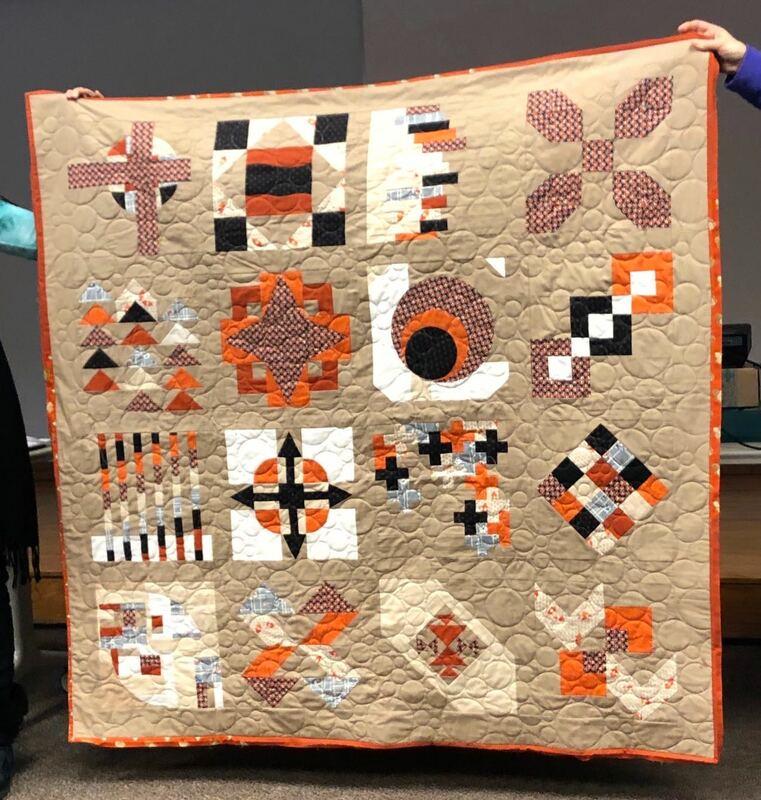 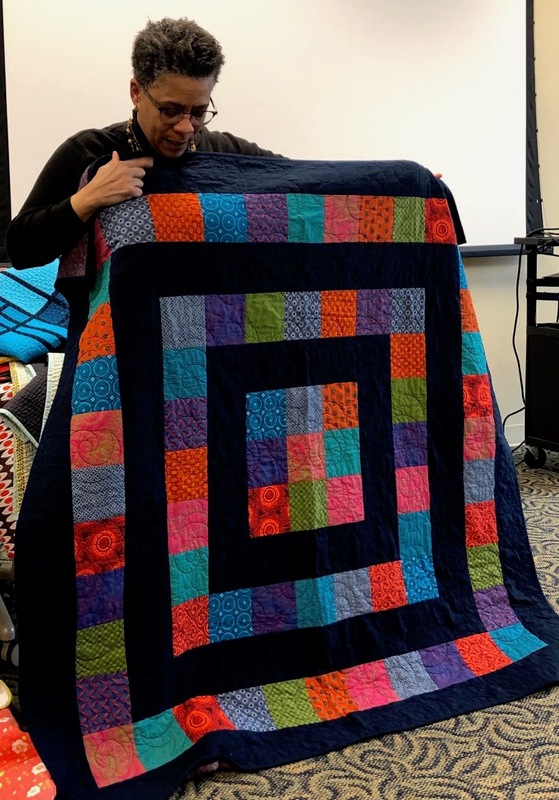 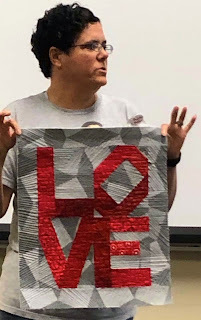 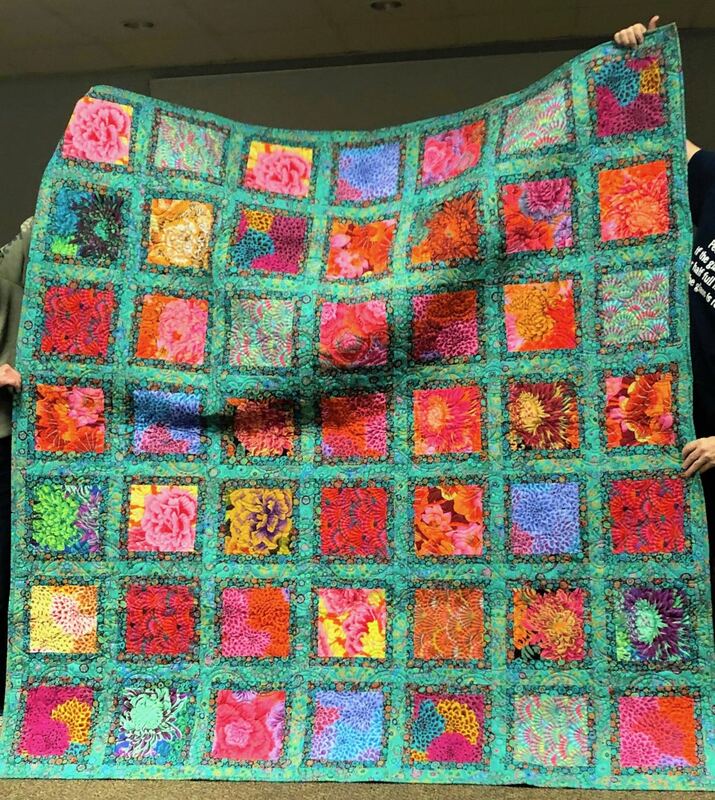 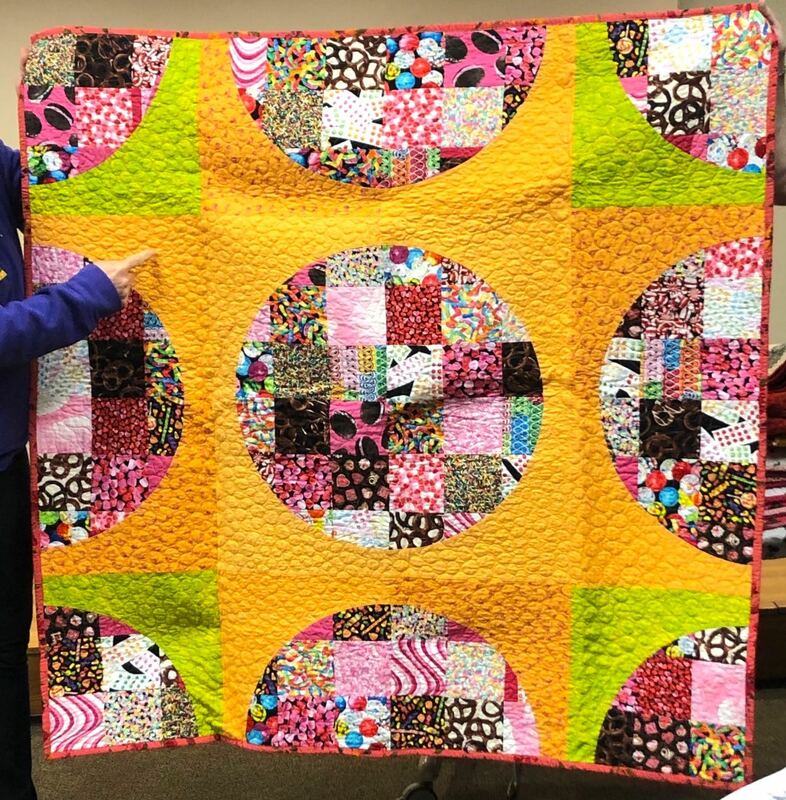 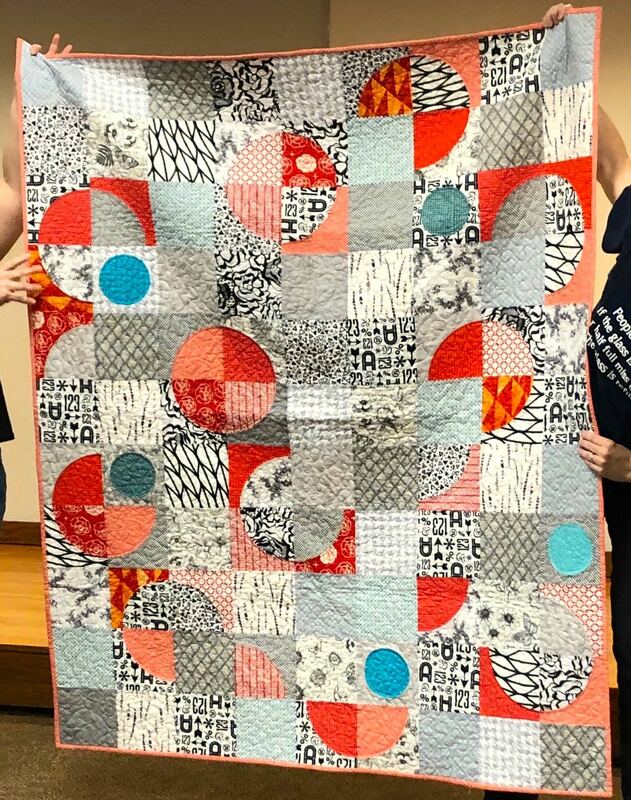 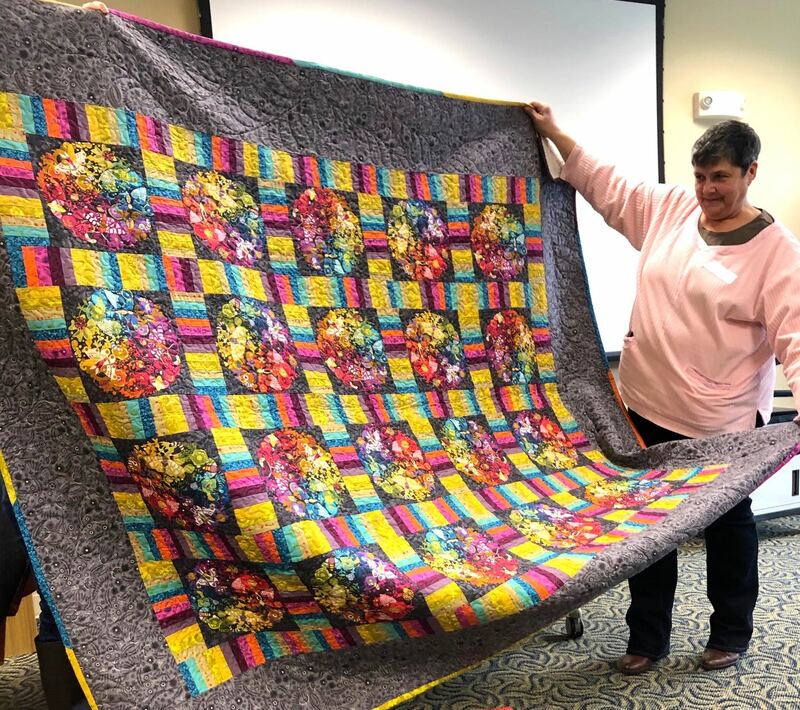 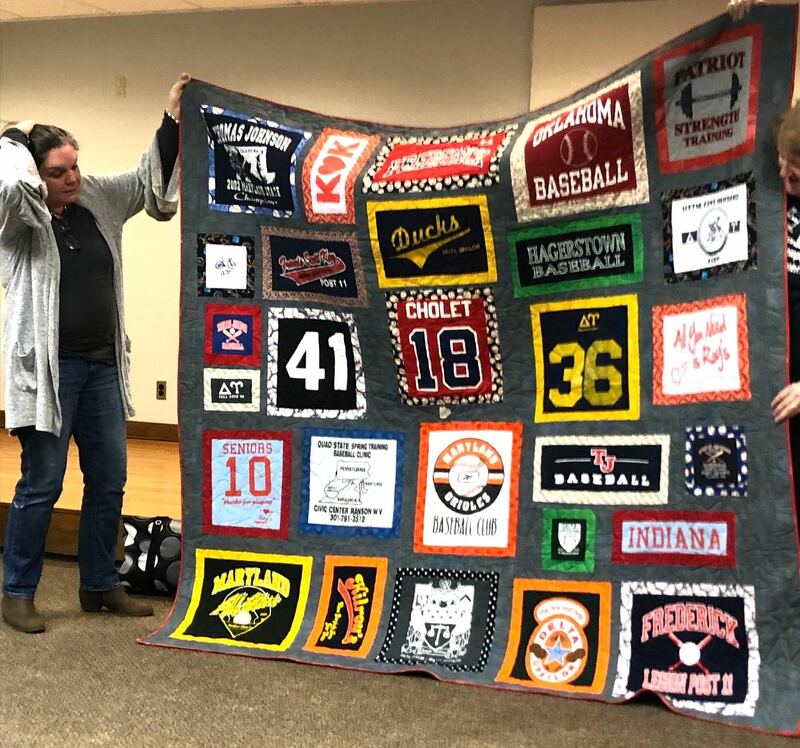 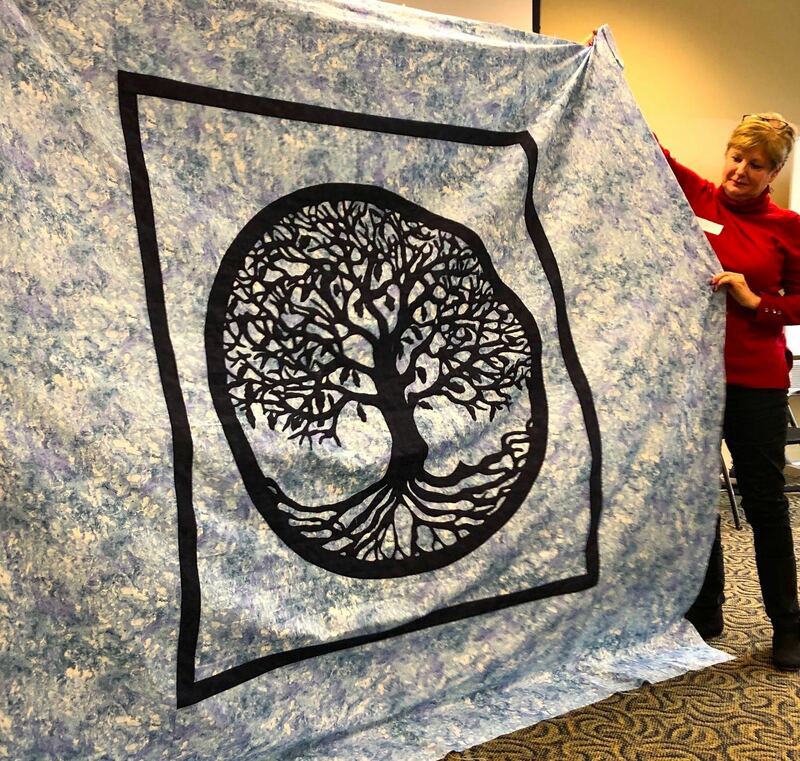 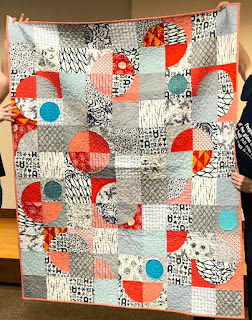 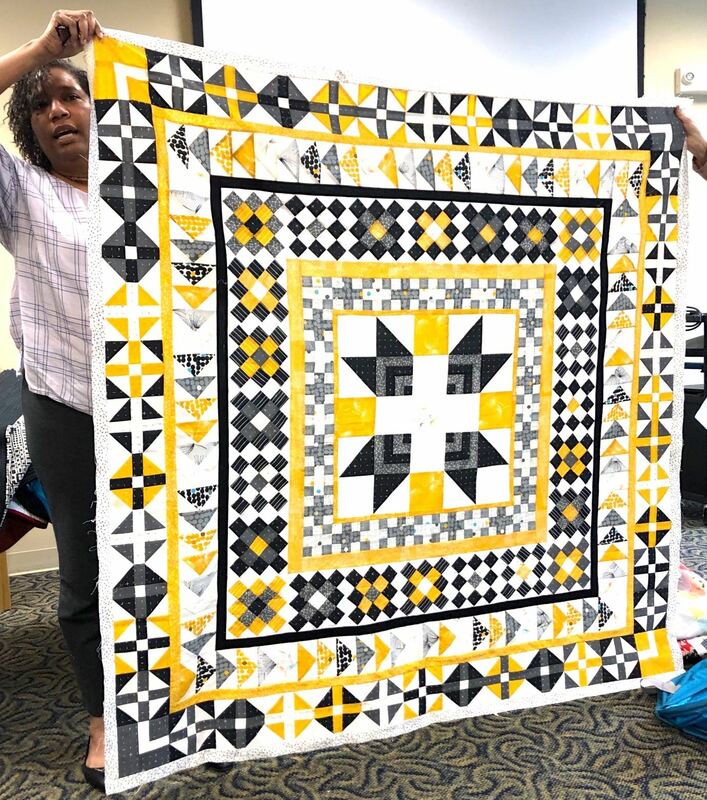 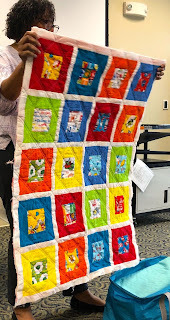 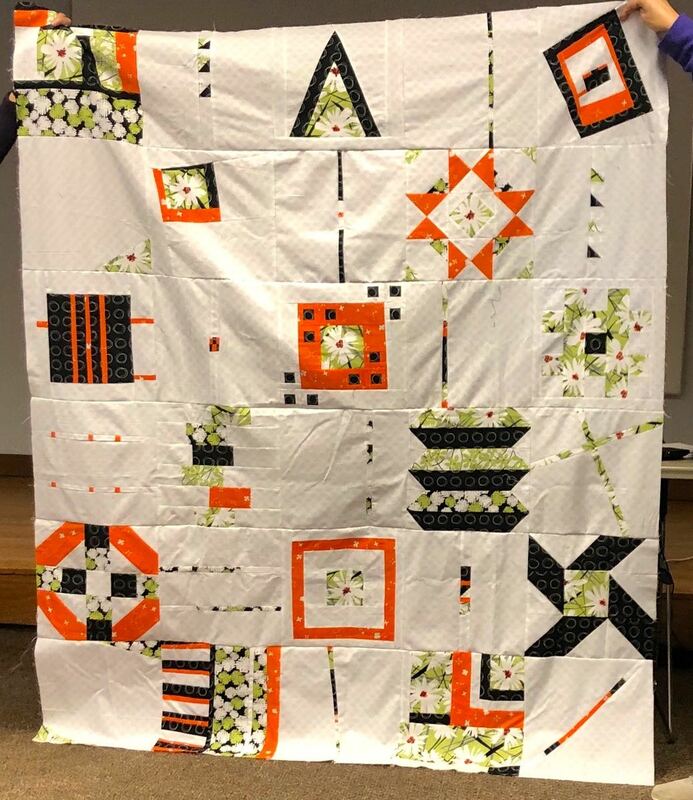 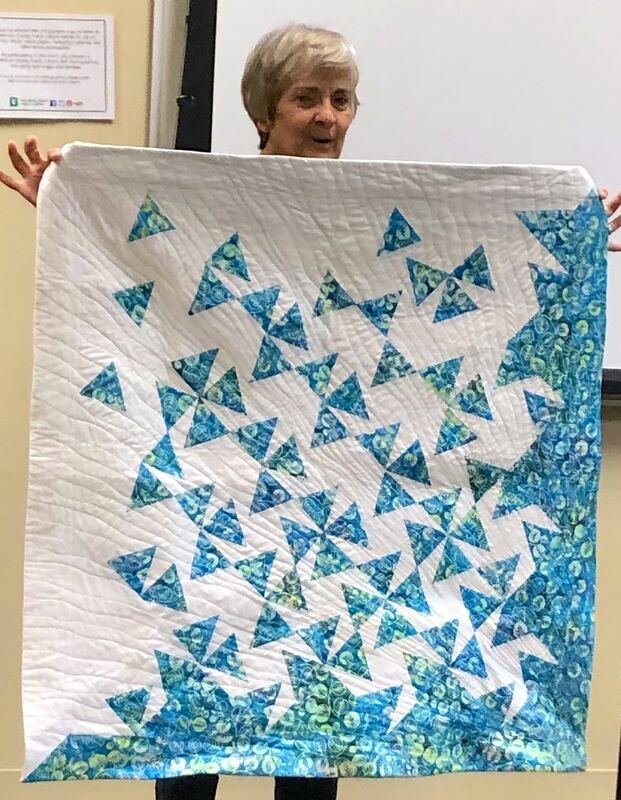 Phyllis Cook participated in the mystery quilt project in 2017. She made her blocks into pillows for a friend. 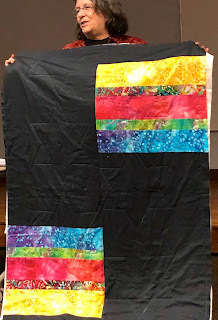 These are two of the four results. 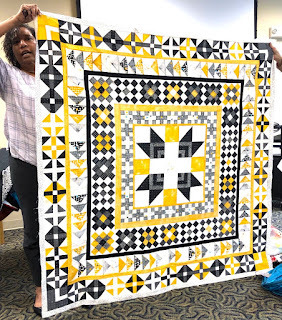 These folks made tops and quilts as the result of Bee projects. 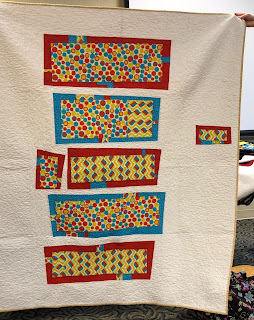 at the 2018 retreat from donated TimTex materials/pattern. result of workshops offered by the guild last year. 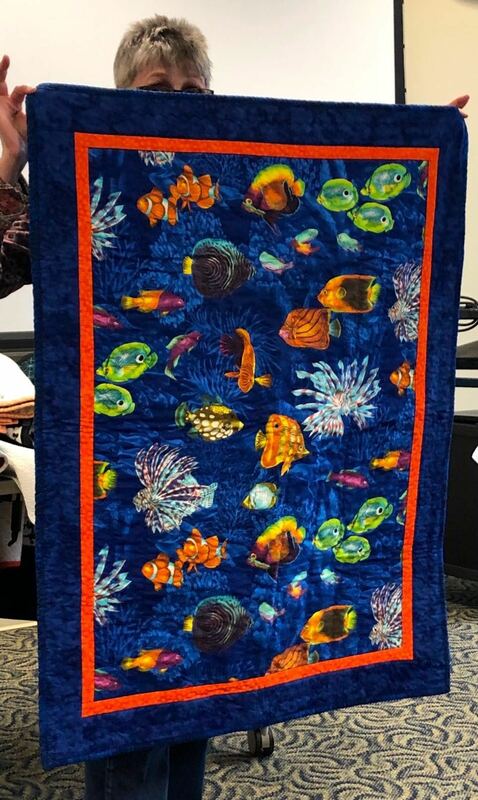 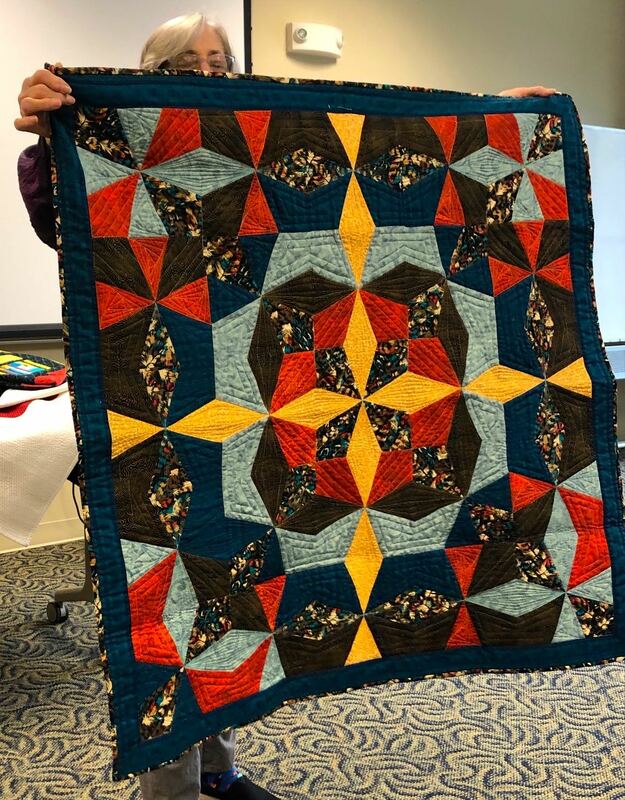 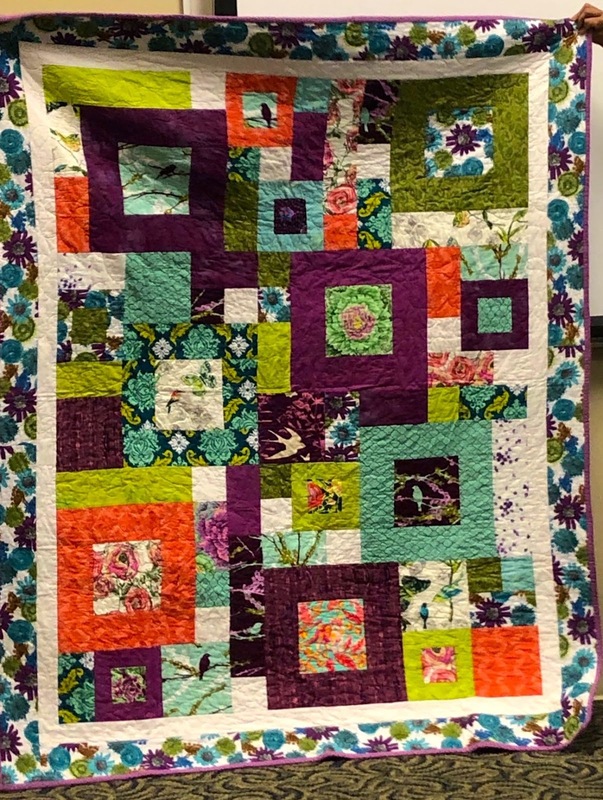 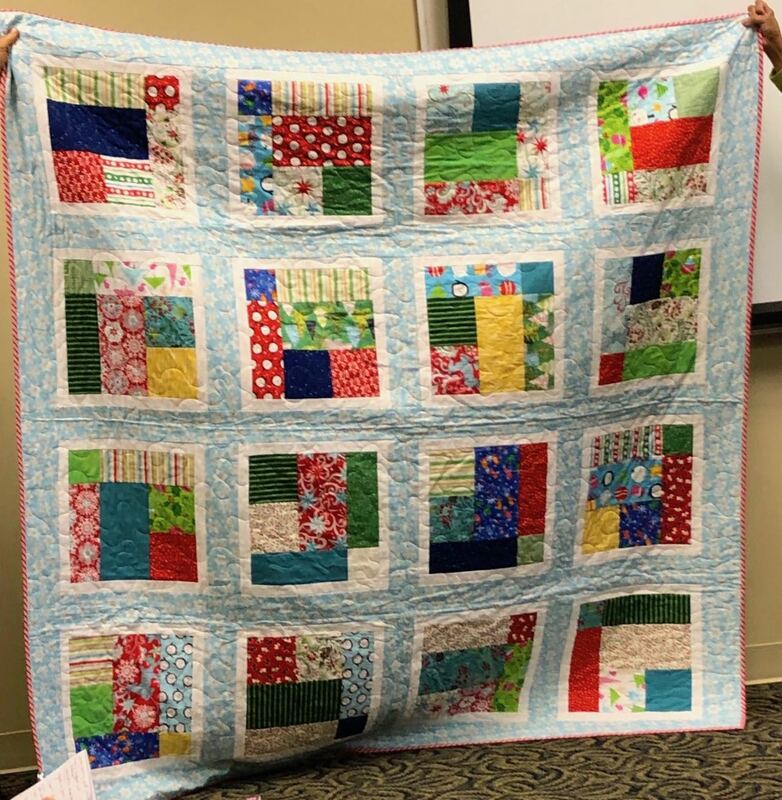 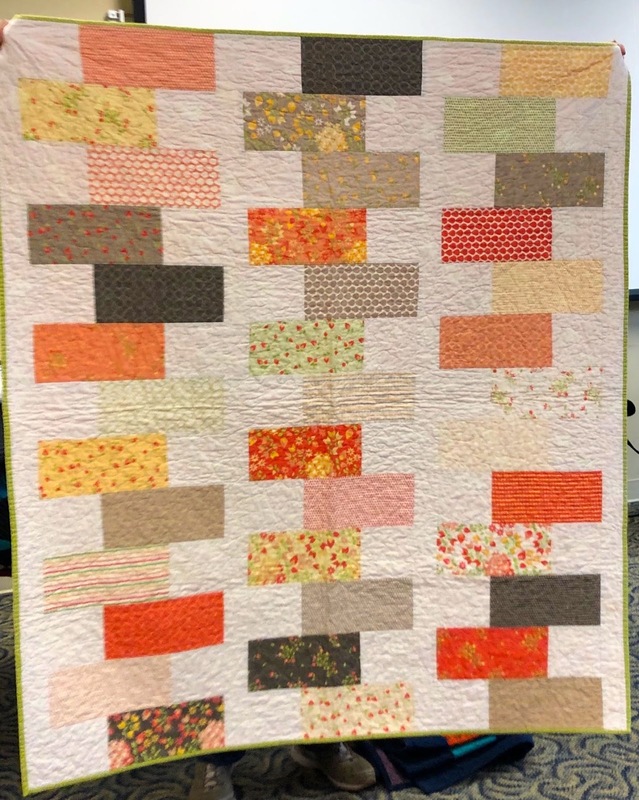 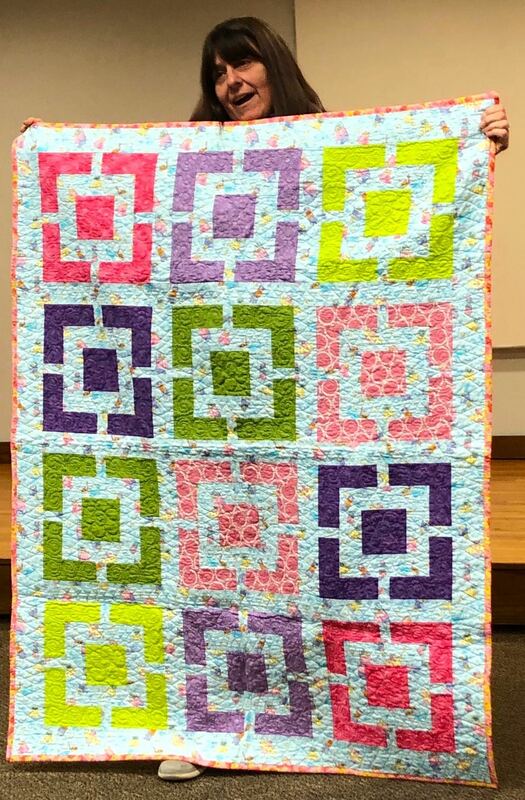 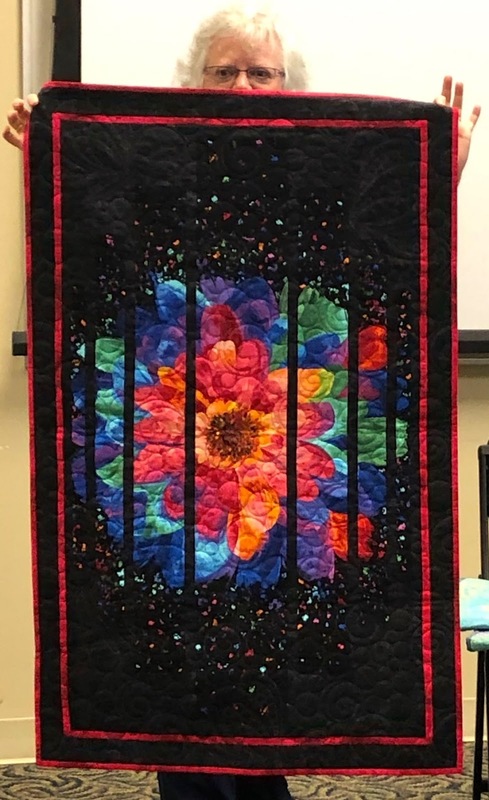 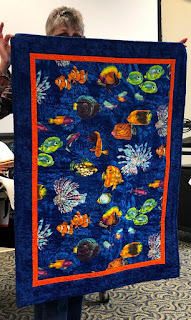 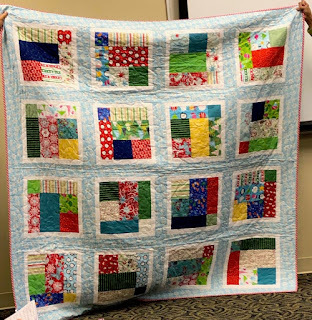 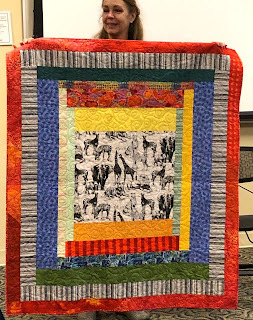 Pam Fischer recently finished this quilt in a beginning class. 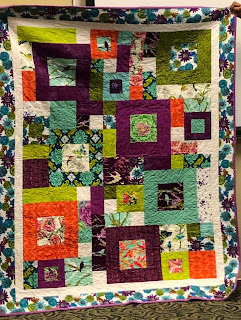 Paper Piecing on her coming vacation to the West Coast. 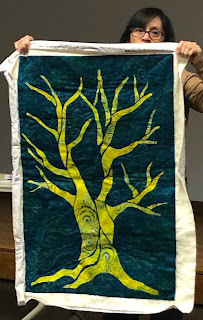 pillow and an appliqued tree wall hanging. 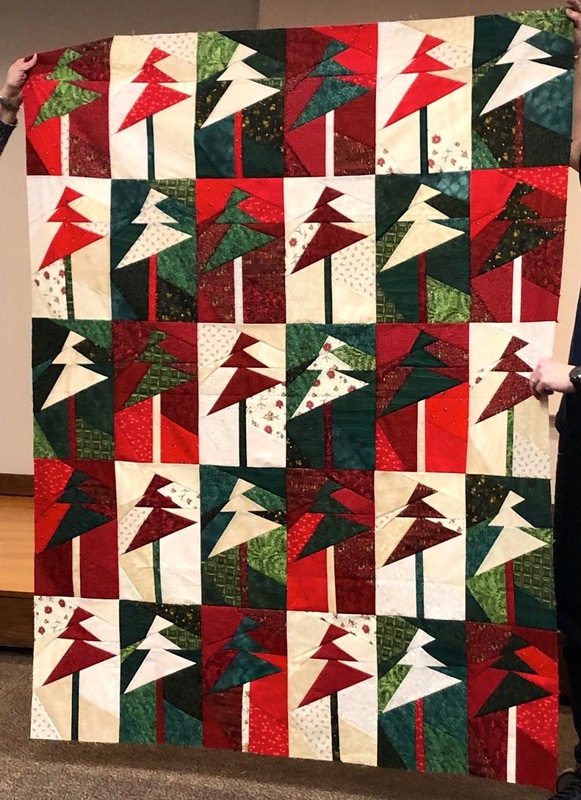 floral prints and the other a Christmas tree sampler. 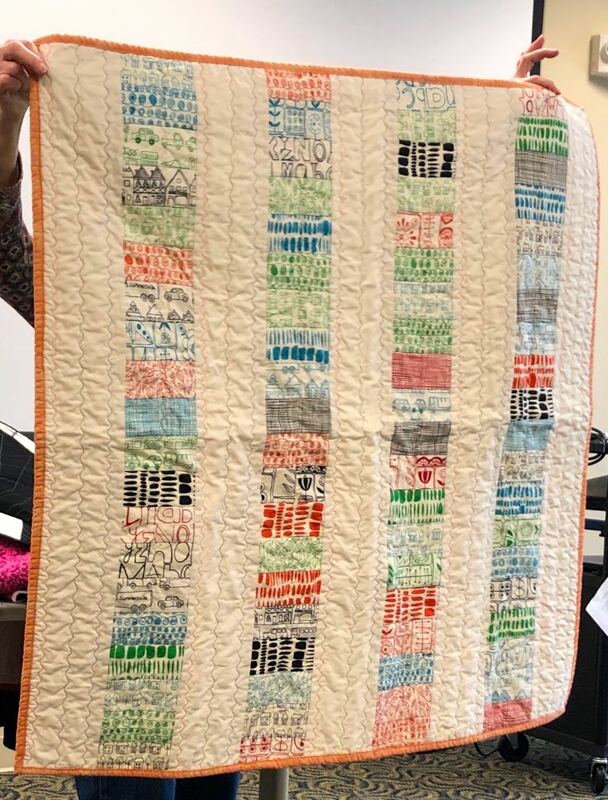 Claire Allen quilted a sampler (from Bee blocks?). Springwater Designs and a baby quilt for friends. 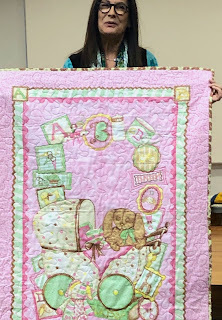 a quilt for her grandson's birthday. 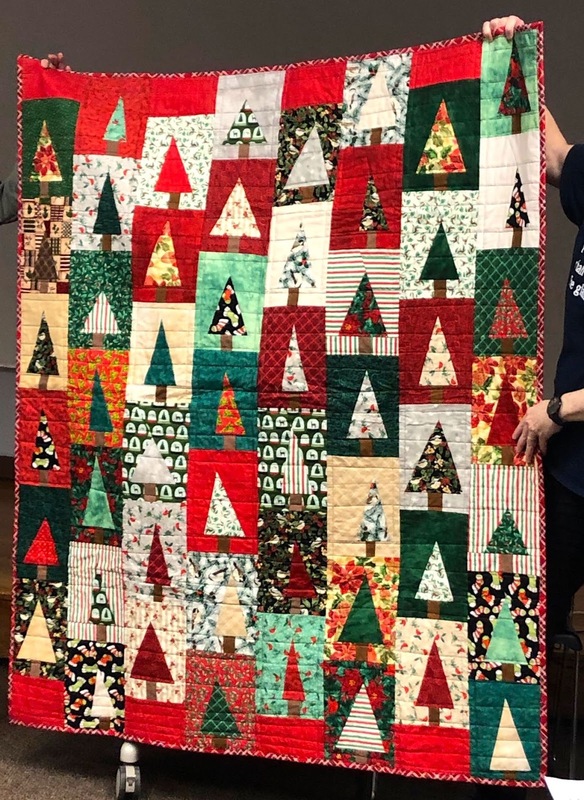 Diana Morraye made a wonky Christmas tree quilt. 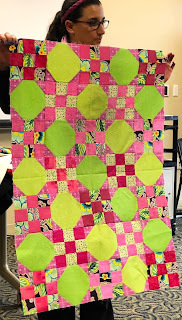 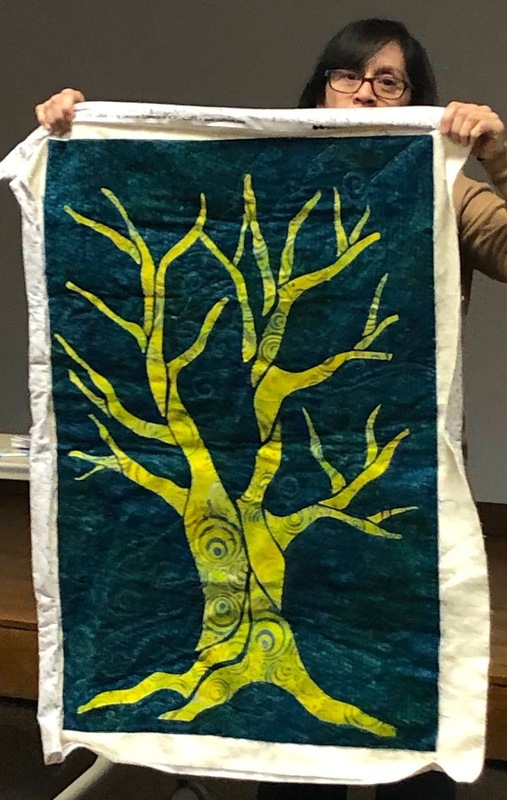 Diana Fertsch finished a beginning quilt from cool colored batiks. 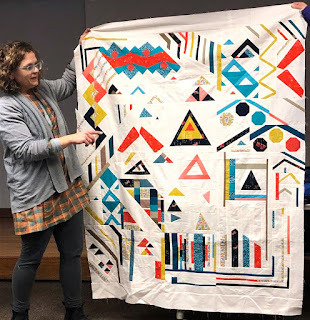 Kate Lane bought an antique YoYo top and finished another TShirt quilt. a Sloth quilt for her grandson. 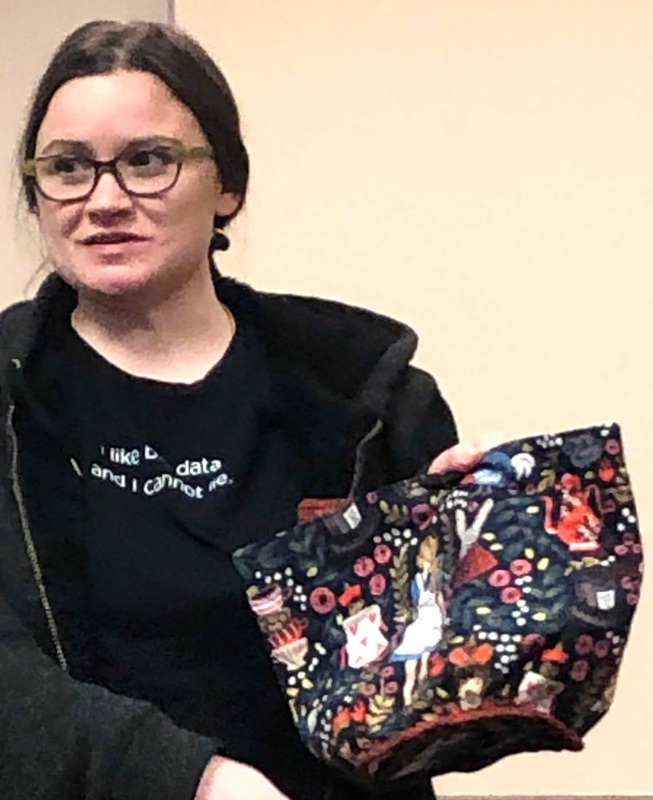 Sarah Lefebvre made a tote bag, a new name tag for herself and a mini quilt. 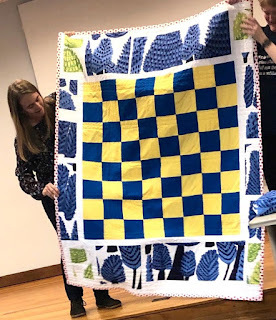 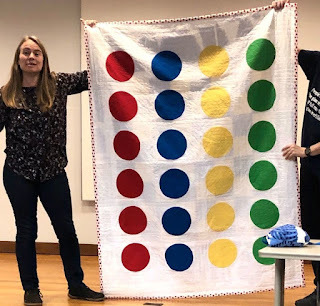 Laura Baltatzis quilted a Twister 'board' and a Checker 'board' for her family. I (Linda Schiffer) completed Summer 2018, a daily temperature quilt. 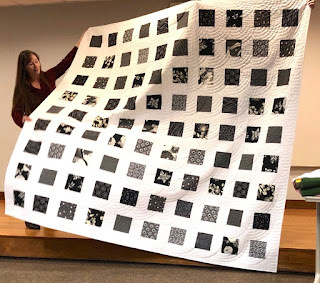 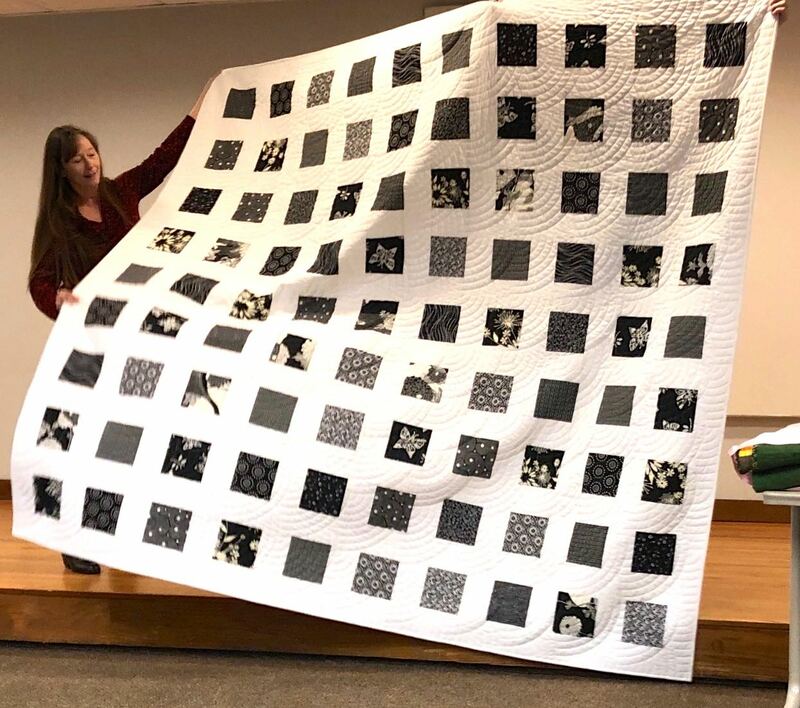 Susan Brightman finished a black and white print sampler quilt. 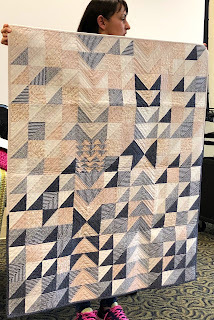 Rebecca Nichols finished a number of quilts with her new longarm setup. 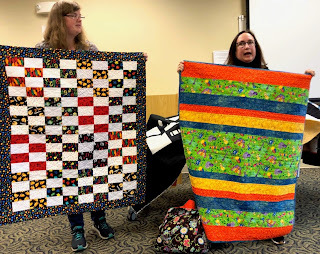 them started in workshops or exchanges in our guild. 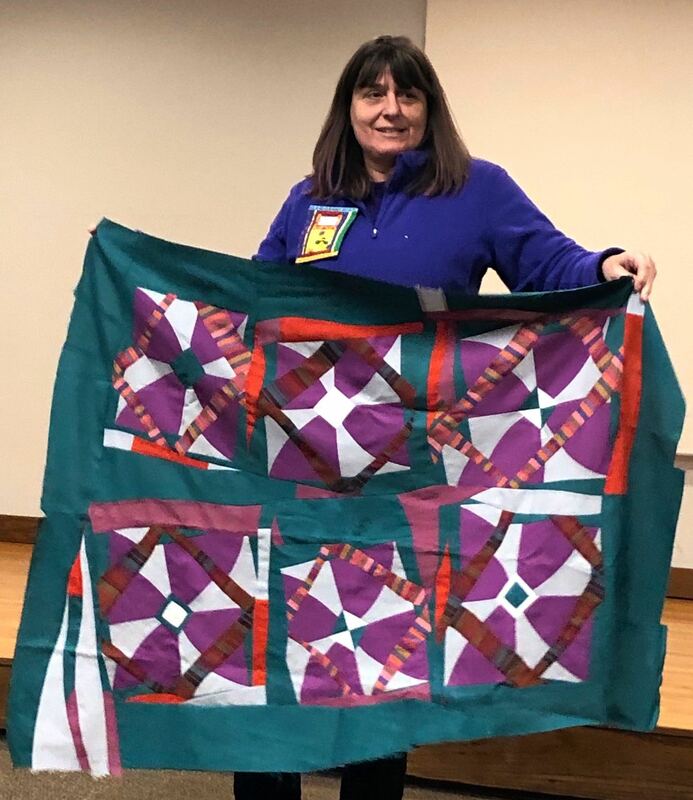 quilt and a sample of our Chapter Logo. 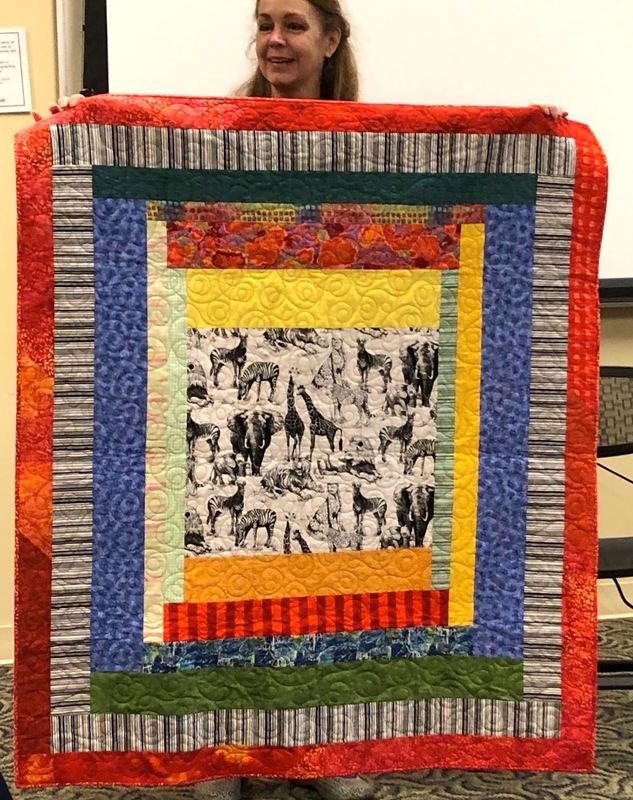 Rebecca Severt finished a quilt started in a Becky Goldsmith class. 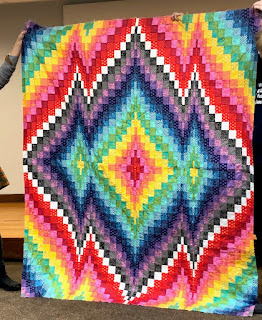 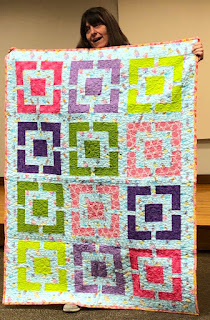 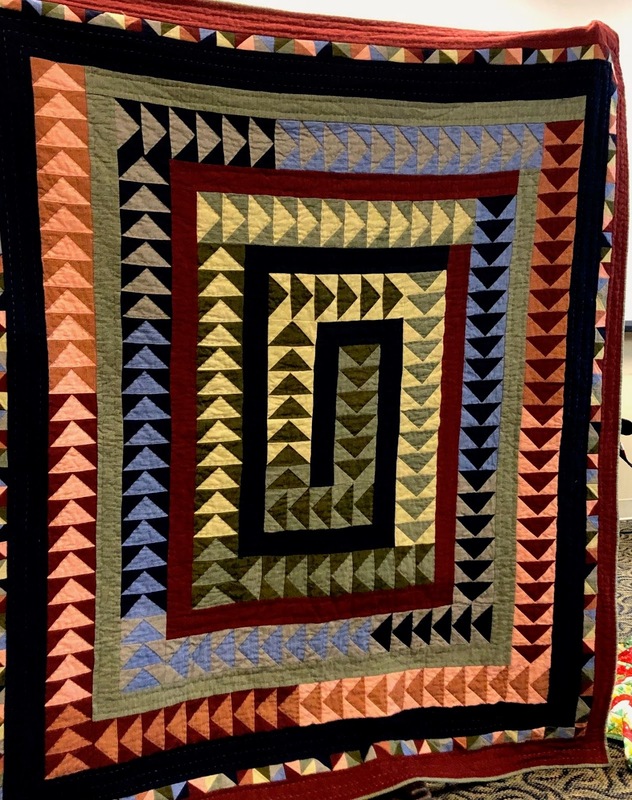 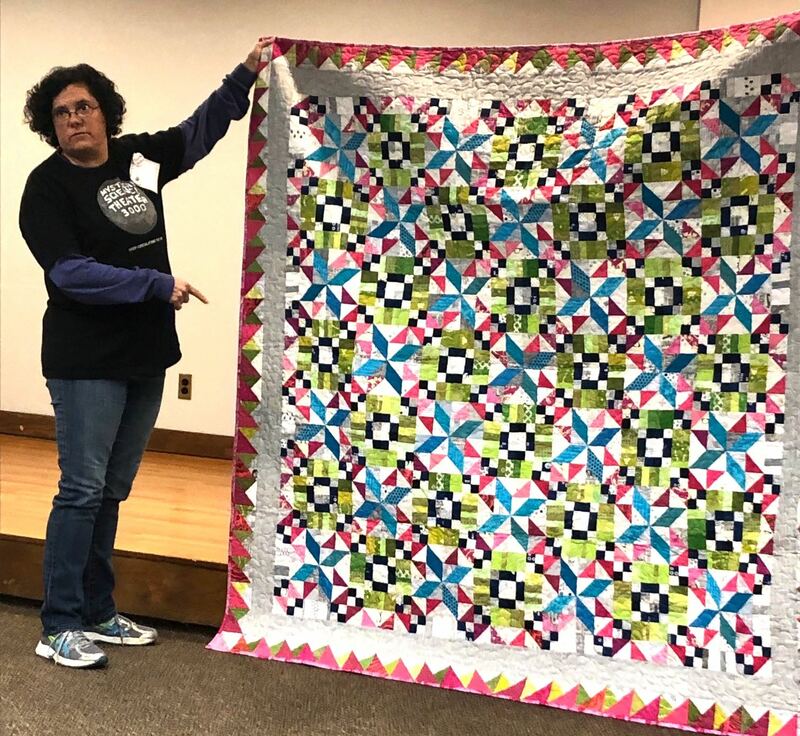 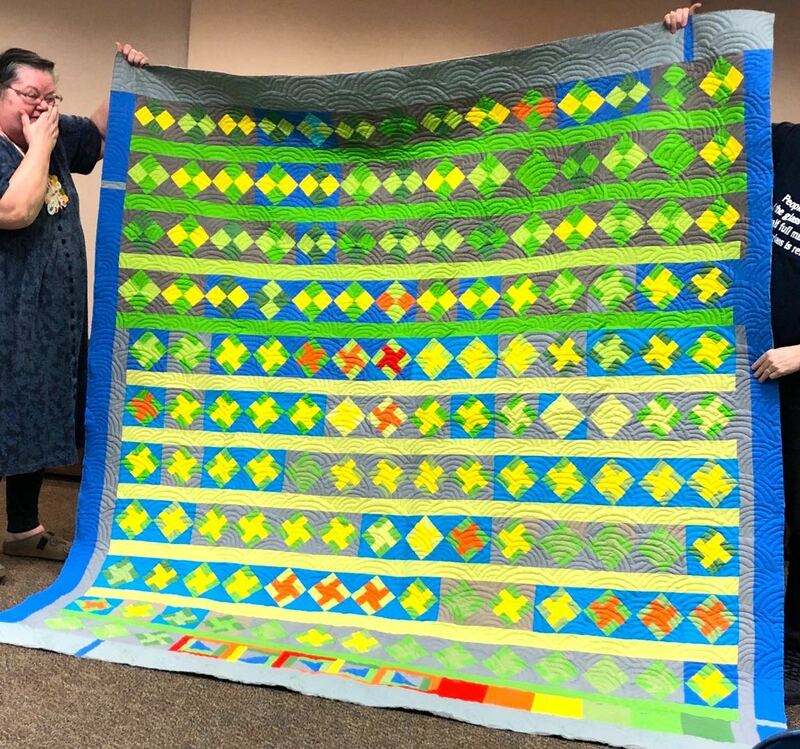 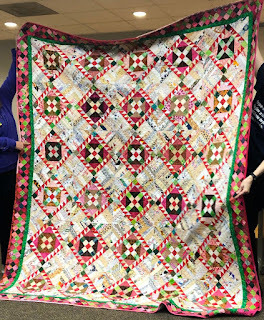 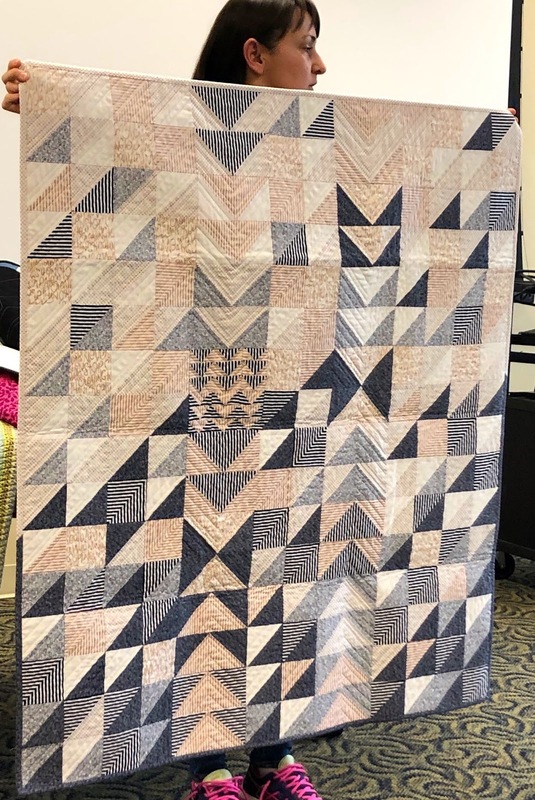 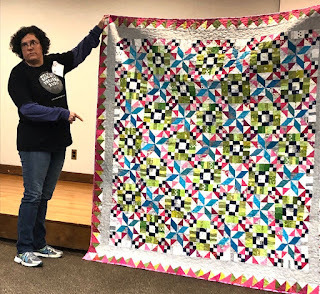 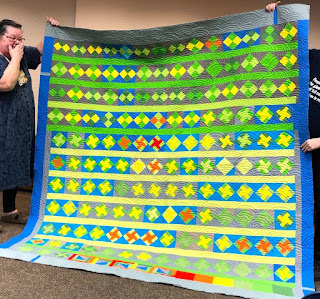 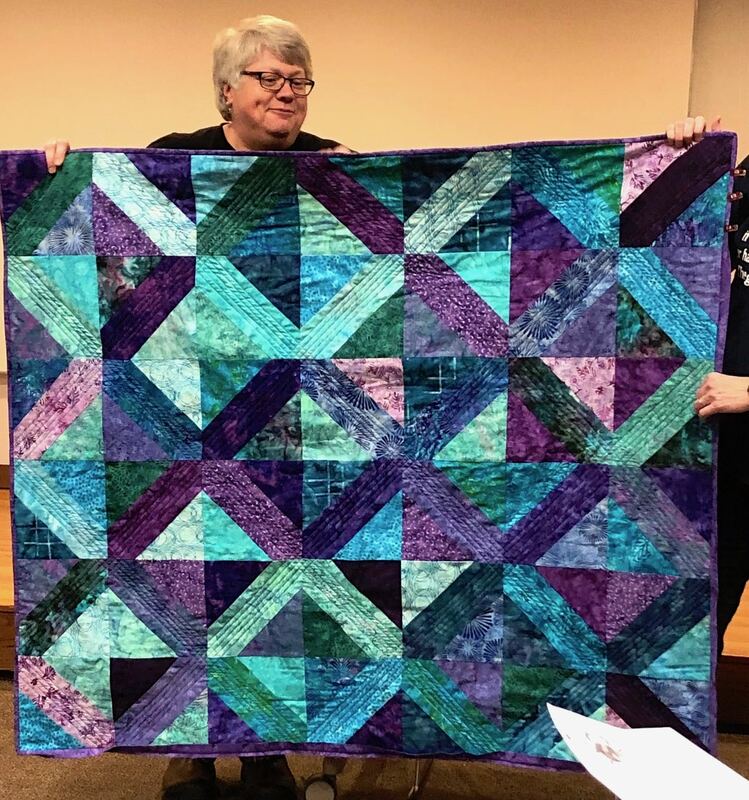 Rebecca Rusch finished a Bonnie Hunter mystery quilt. 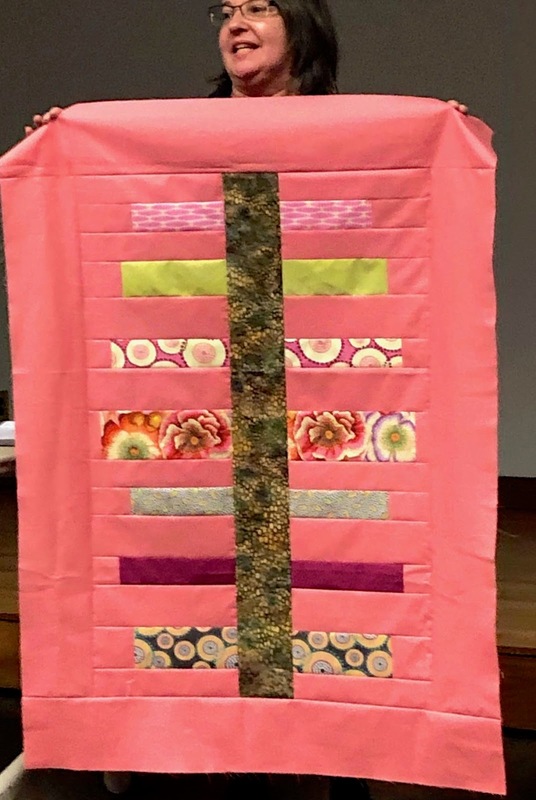 Ruthie Gumnitzky shared a quilted table runner. Jane Schiemer made a professional tote. 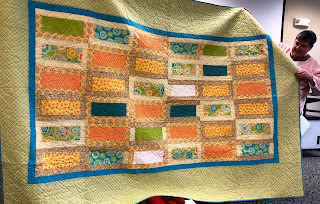 Summer Rankin made a quilted tea post cosy. 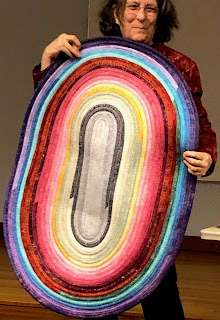 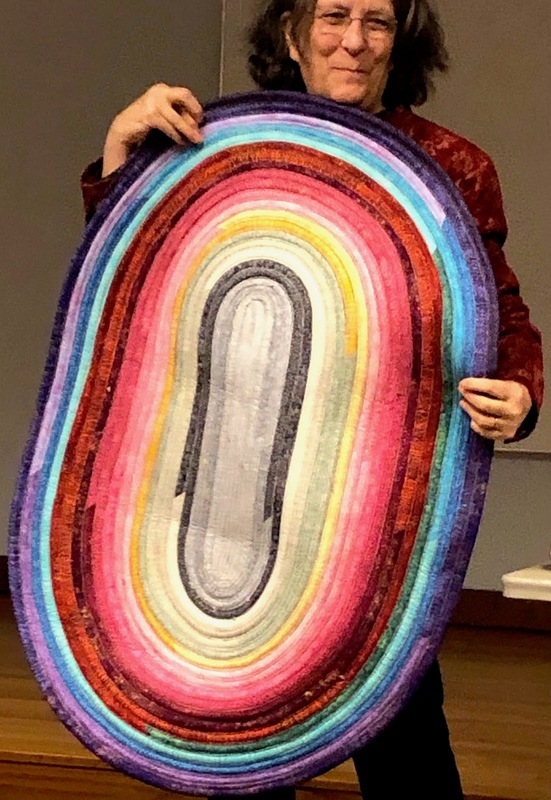 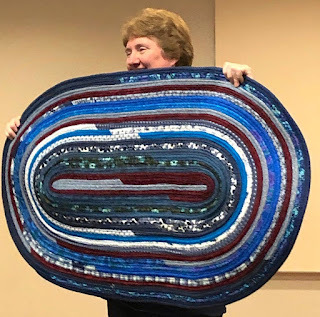 Rose Daley made a quilted Jelly Roll Rug for her husband. Photos taken and post written by Linda Schiffer. Please report errors and such to me directly. 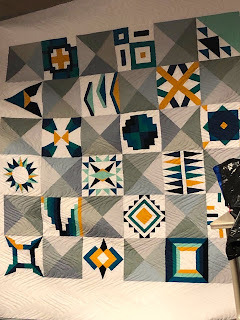 My apologies for any of the same!